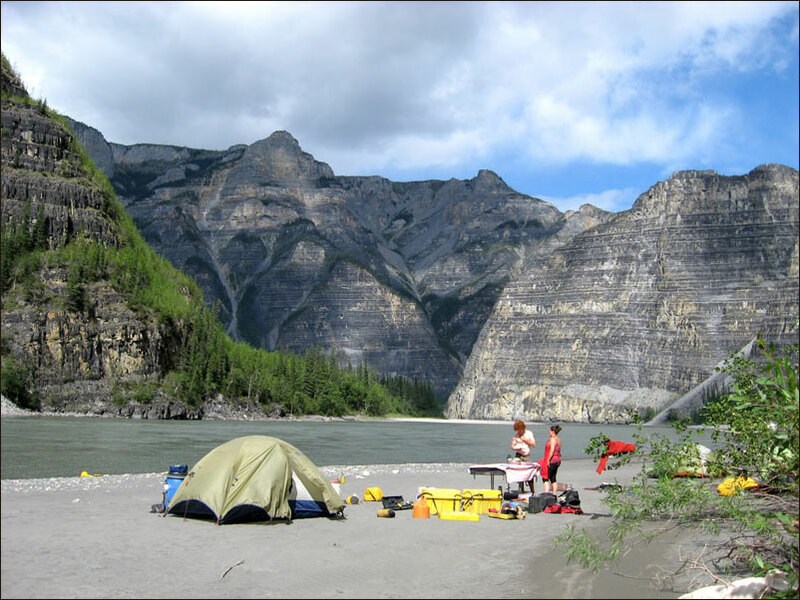 We had been talking about doing the Nahanni River for a number of years, but had put it off due to financial concerns (It's not a cheap trip!). 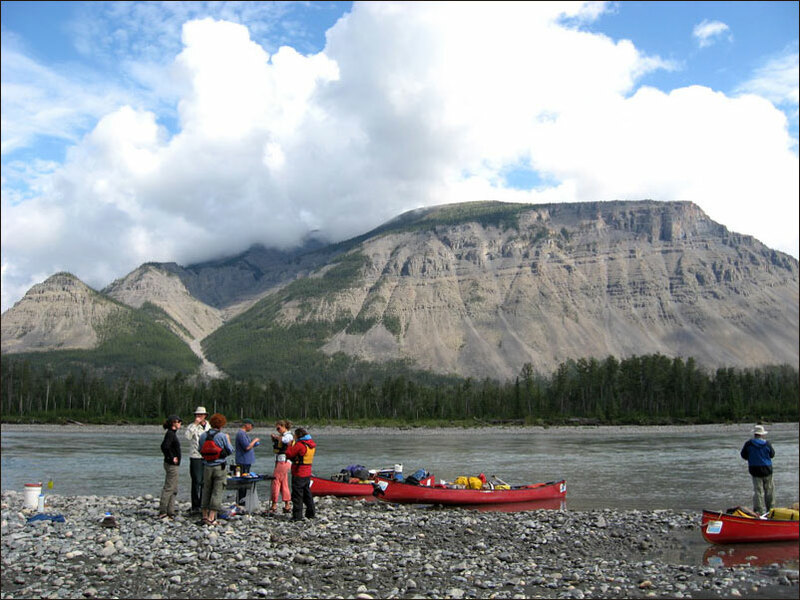 This year we decided to go for it while we could still handle the trip by canoe. Rafting the river, for us, was out of the question. 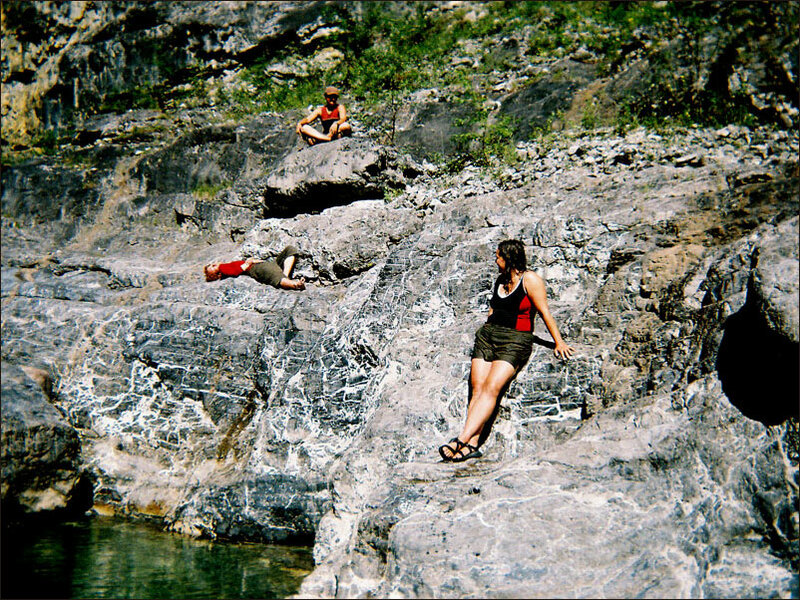 We wanted to enjoy the river physically as well as mentally. If someone were to suggest that we do the trip again, we would in a second, given that the same guides were available and we had the financial capability. 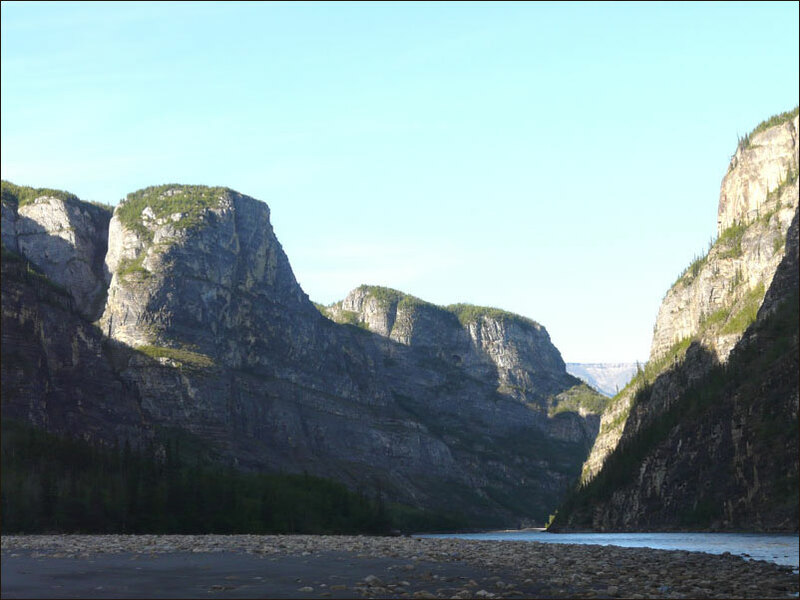 Nahanni National Park Reserve is a jewel of Canada's North. 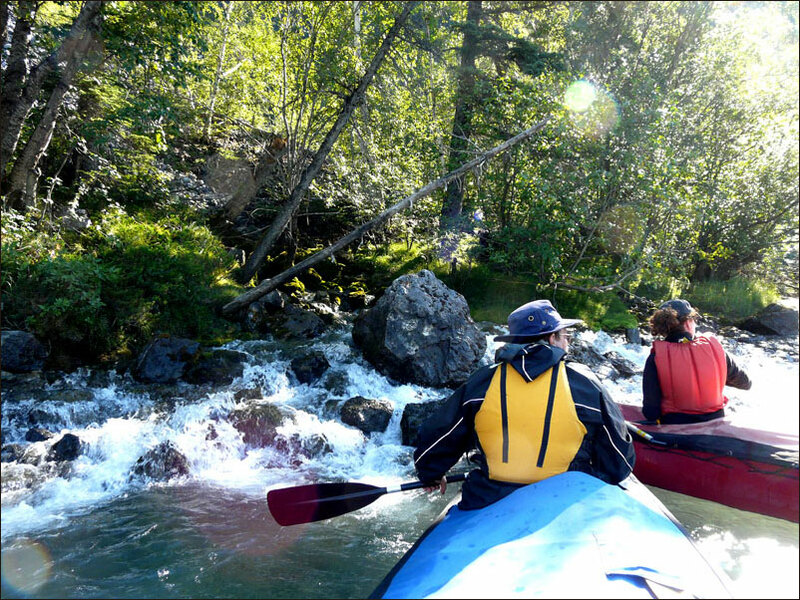 Set in the southwest corner of the Northwest Territories, the park covers 4,766 km2 and is an outstanding example of northern wilderness rivers and boreal forests. The area was designated a national park reserve in 1972. 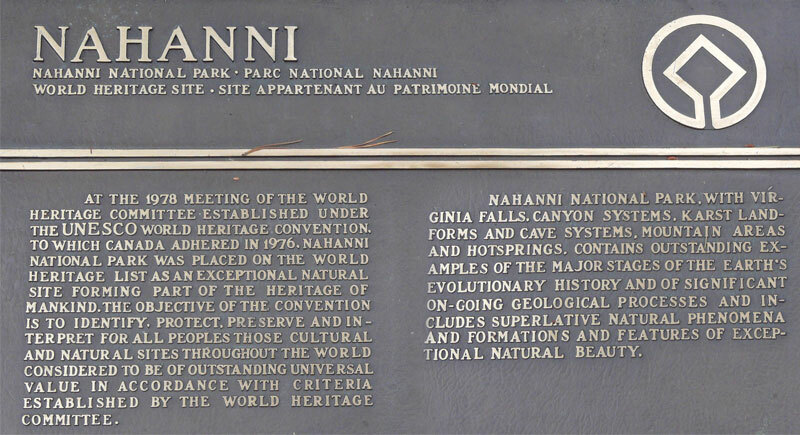 In 1978, it was honoured as the first natural World Heritage Site by UNESCO (United Nations Educational, Scientific and Cultural Organization). This highlighted the international significance of the park's natural heritage and ranked it with the Galapagos Islands and the great pyramids of Egypt. 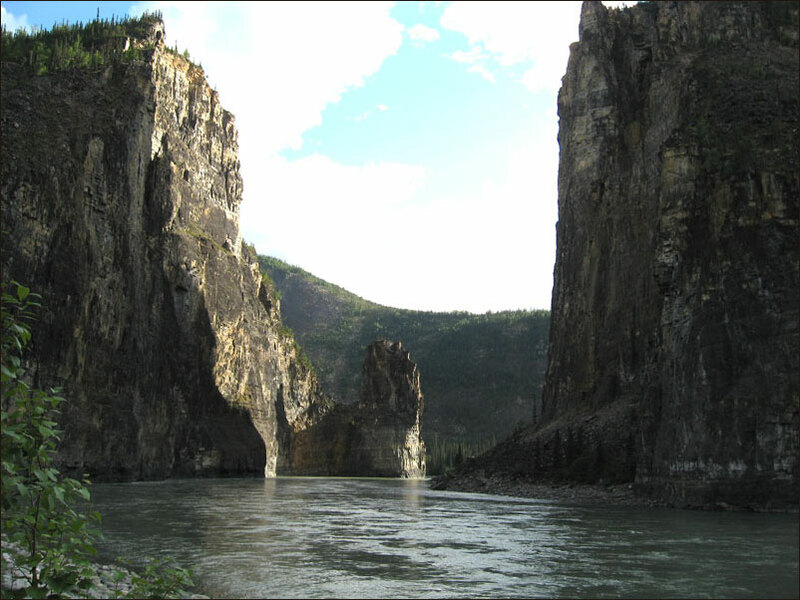 Nahanni has one of the deepest river canyon systems in the world and one of the most remarkable karst limestone landscapes found anywhere. 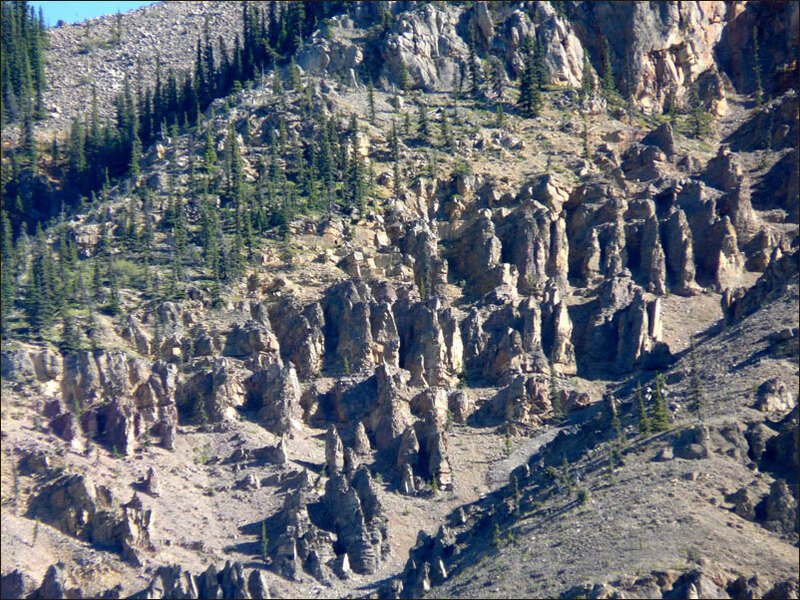 Rabbitkettle Hotsprings has the largest known tufa mounds in Canada, and the vertical drop at Virginia Falls is twice that of Niagara Falls. 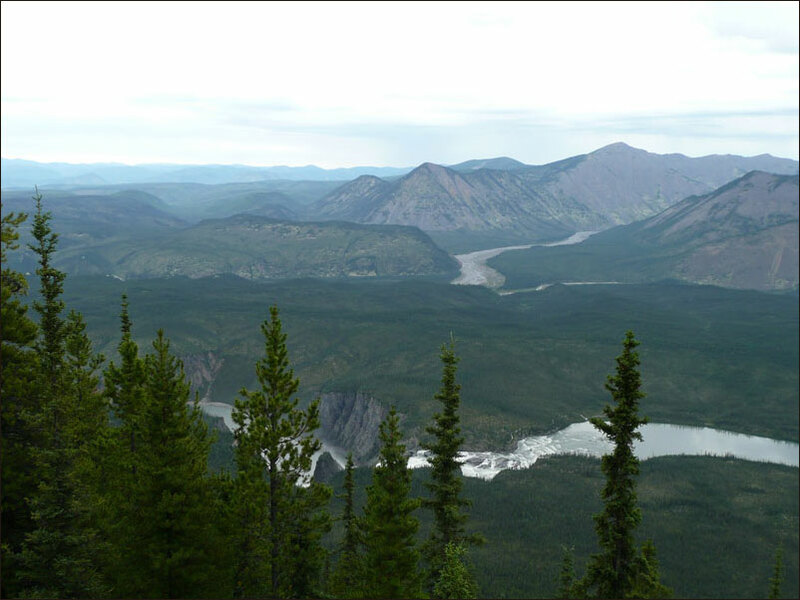 The park's valleys, mountains, meadows and forests are home to a wide variety of plants and animals, some of which are threatened with extinction elsewhere. 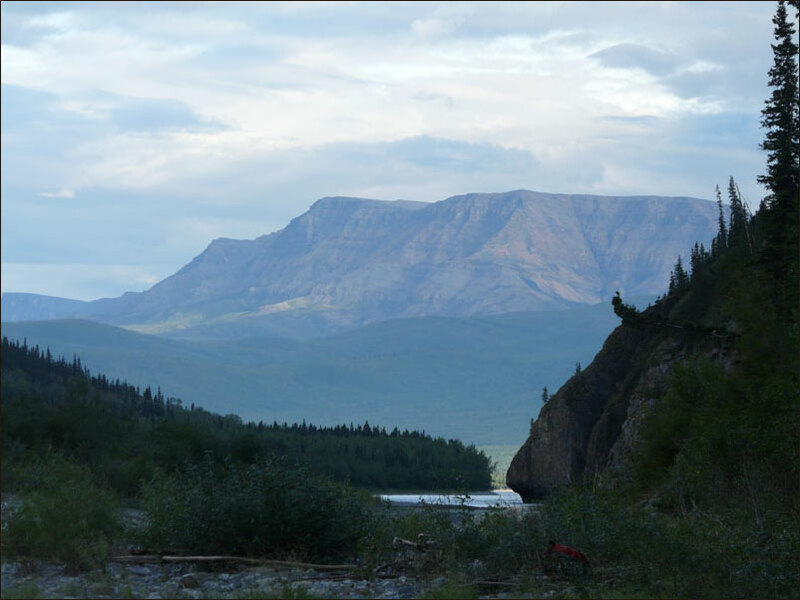 Nahanni is derived from the Nahaa, a nomadic tribe of fierce warriors who once lived in the mountains and raided settlements in the adjacent lowlands. They disappeared mysteriously in the late 1800s. 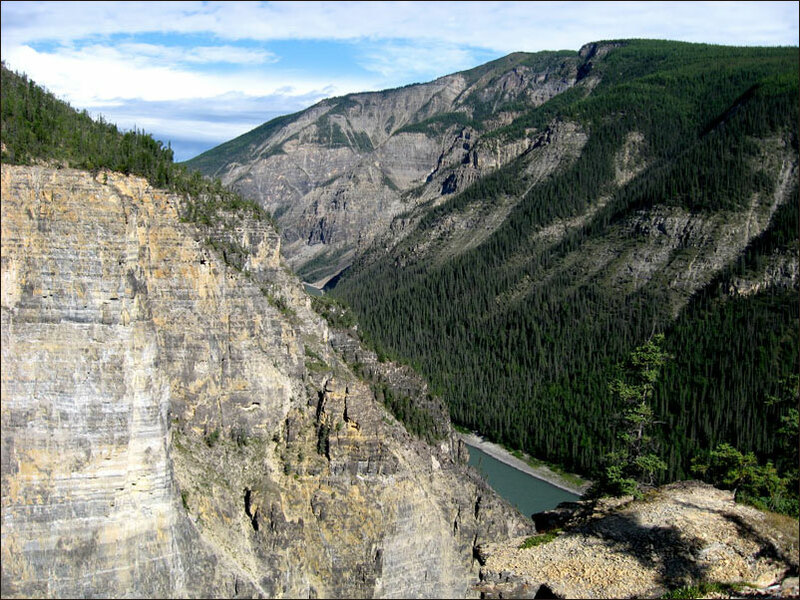 Legends of haunted valleys, lost gold and the headless corpses of prospectors are responsible for some of the names of park features, such as Deadmen Valley, Headless Creek, Headless Range and the Funeral Range. 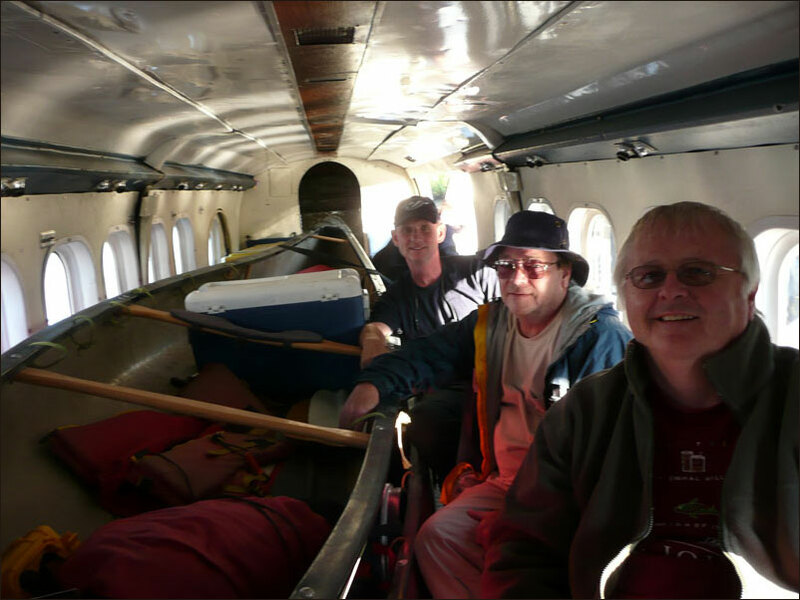 We left Pearson Airport on the morning of July 23, changed planes at Calgary, and spent the night in Yellowknife. We had a look around town. It had changed substantially from when I was here in 1969! 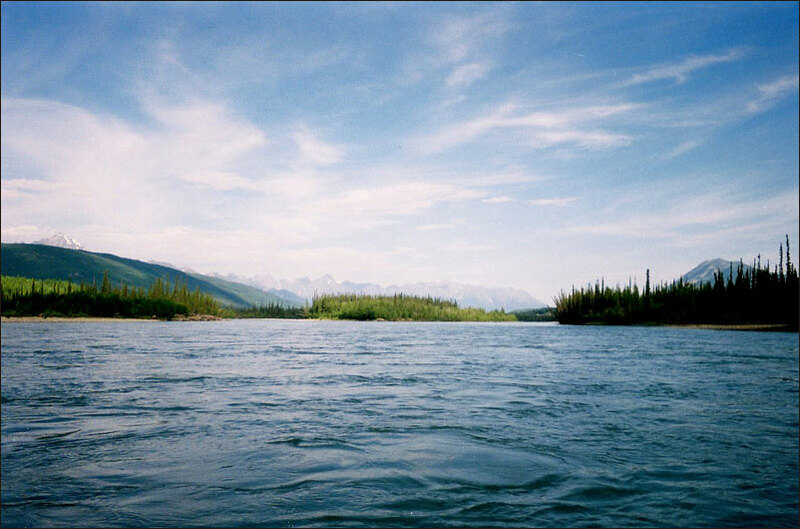 Our next hop took us to Fort Simpson, where we met our guides from Nahanni River Adventures. It was suggested that we shed our watches because of the almost 24 hour sun. Very quickly, we got used to "sun time". 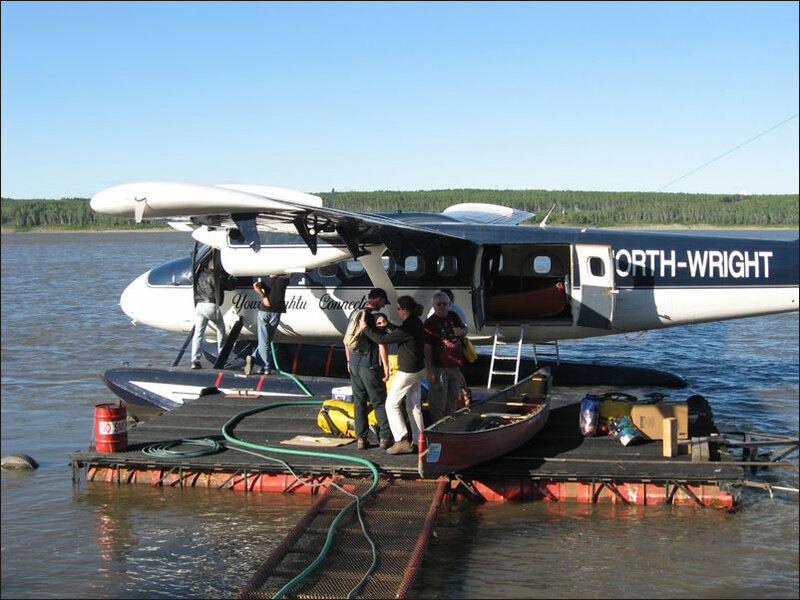 After transferring gear into a Twin Otter in Fort Simpson, we were away. 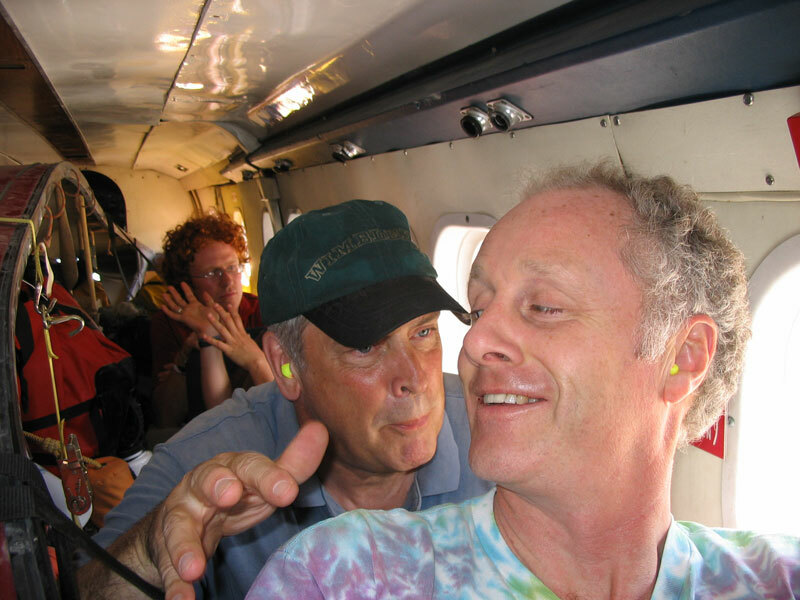 It was a bit of a squeeze to get us and the gear in. It took two flights to get everyone and everything to our start point. 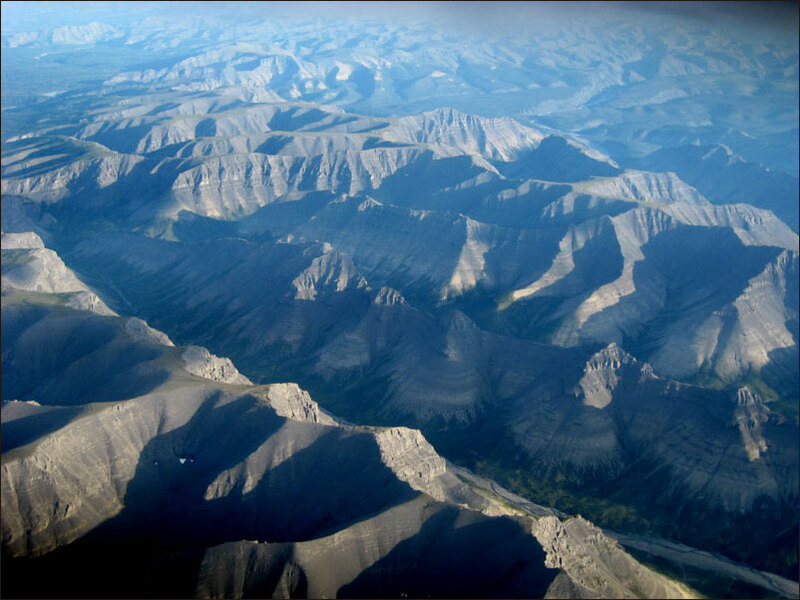 The flight over the mountains to our put-in at Rabbit Kettle Lake was quite spectacular. The erosion patterns were awesome. The contrast between vegetated and bare areas was evident. 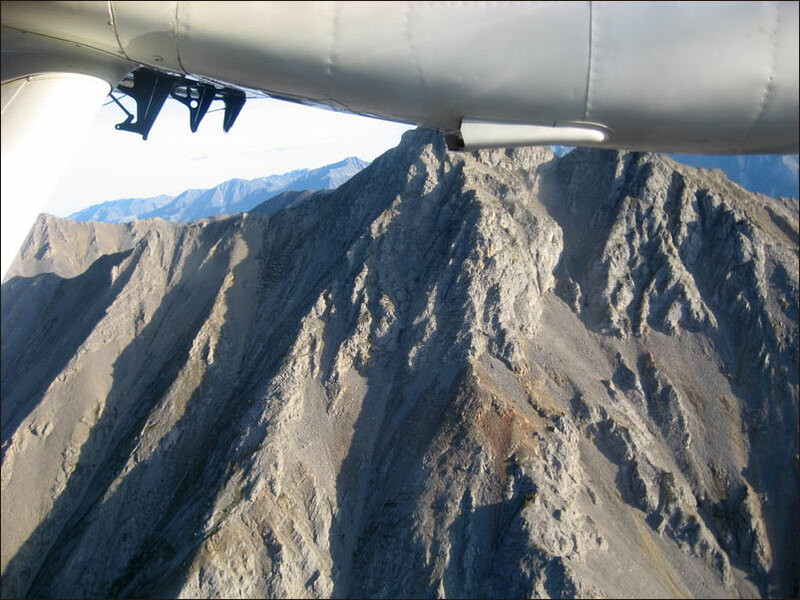 The pilot brought us up close and personal with the mountains. 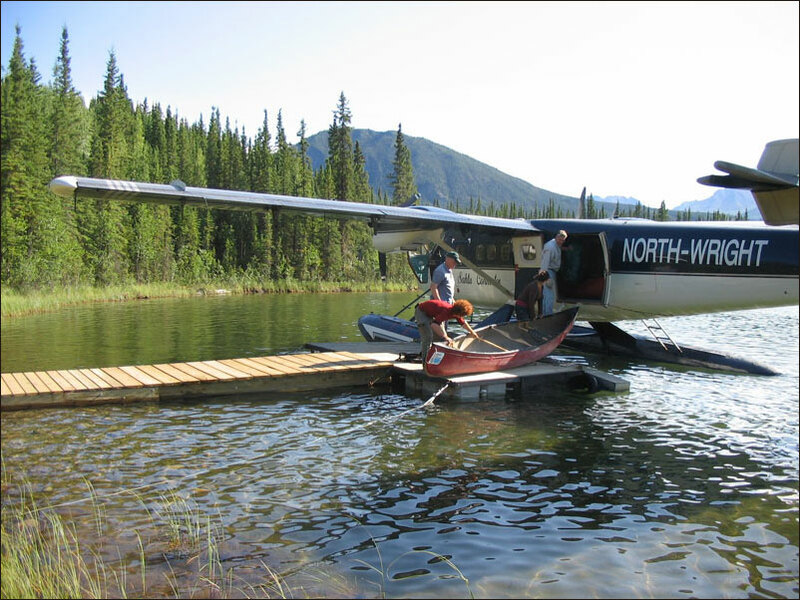 We off loaded the Otter at the Parks Canada dock on Rabbit Kettle Lake. 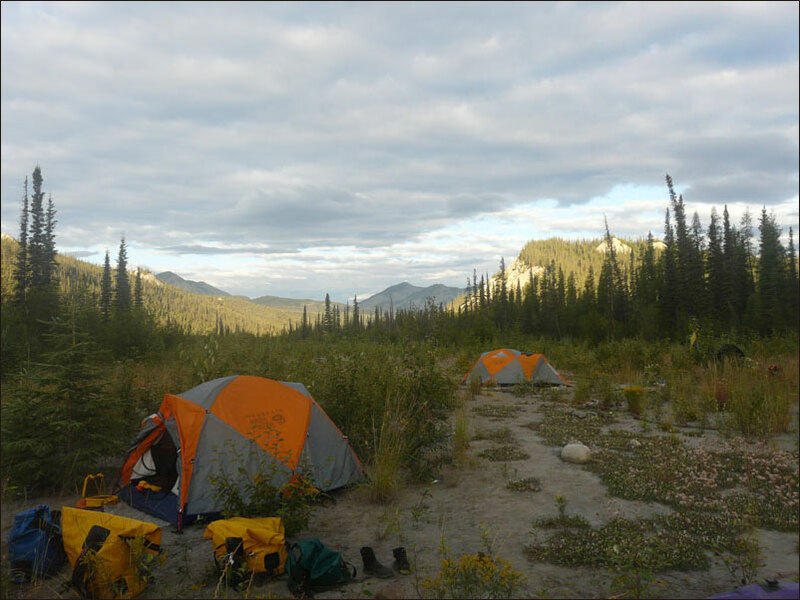 Rabbit Kettle Lake was a pristine, beautiful, fairly isolated location. A great start to our trip! The Parks Canada Warden took us on a hike to the Tufa Mounds. This is a 'Zone 1' area which is only accessible with a park guide. 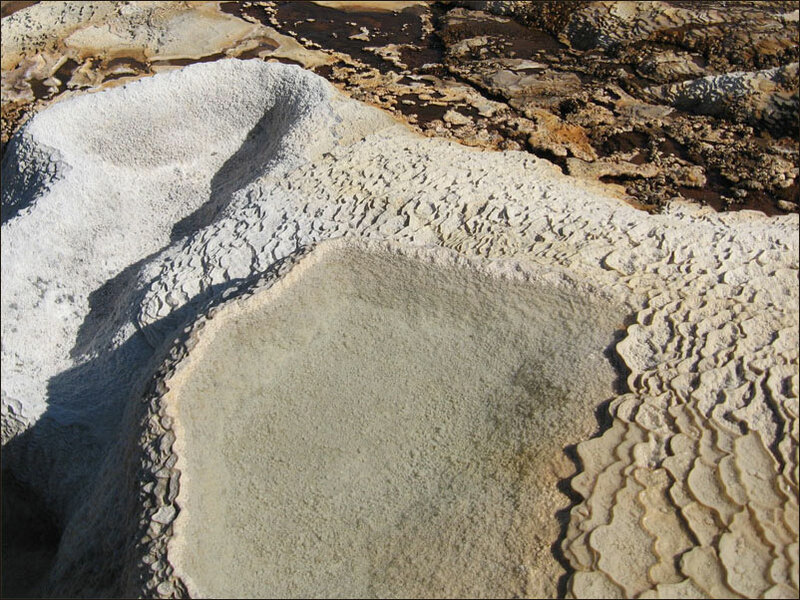 The fragile, terraced mounds are made of calcium carbonate and are about 10 000 years old. 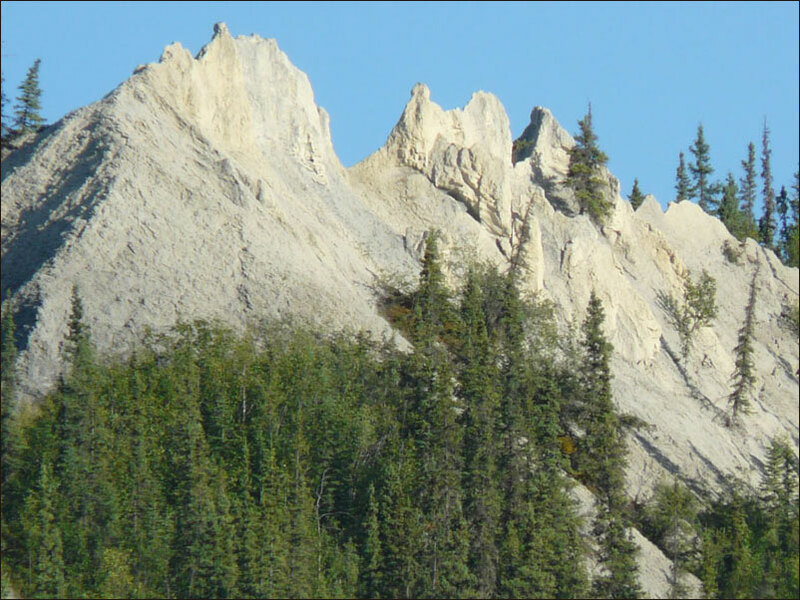 The Rabbitkettle tufa mounds are the largest in Canada — one is 27 metres high and 74 metres across. 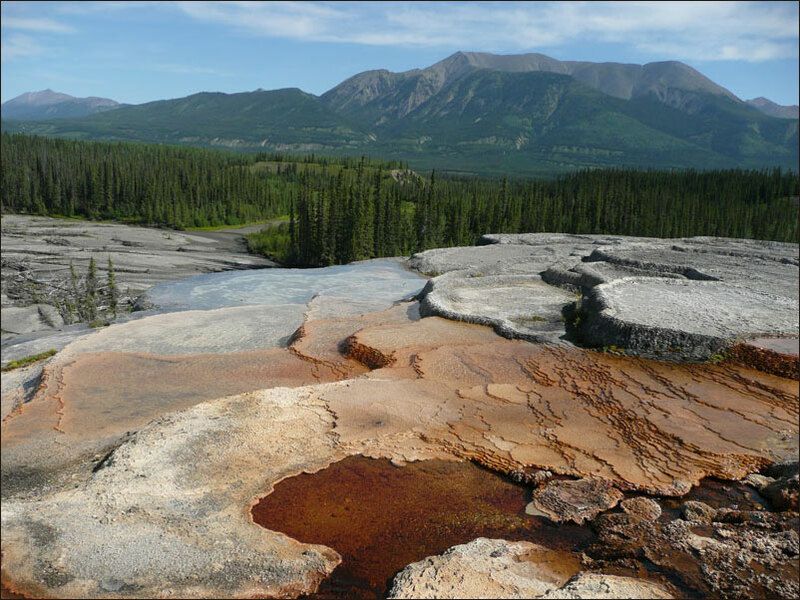 Hot springwater that stays at 20 degrees Celsius year-round bubbles 2,000 metres to the surface and spreads thinly over the mound. 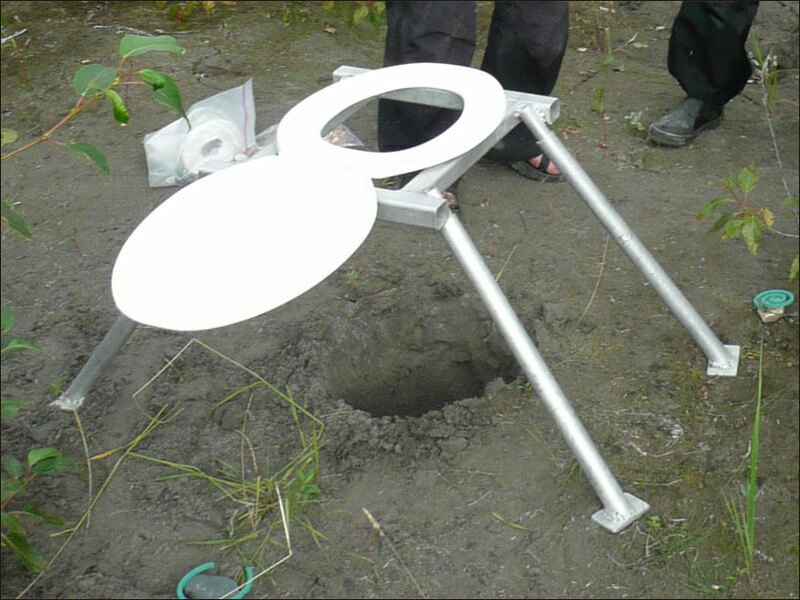 As it cools, calcium is deposited in small rings at a rate of 2 millimetres per year. 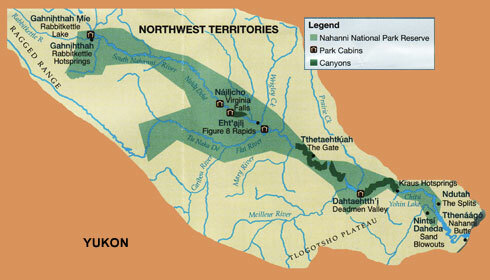 The Gahnihthah, as they are called by local Aboriginals, hold great cultural importance for the Dene. 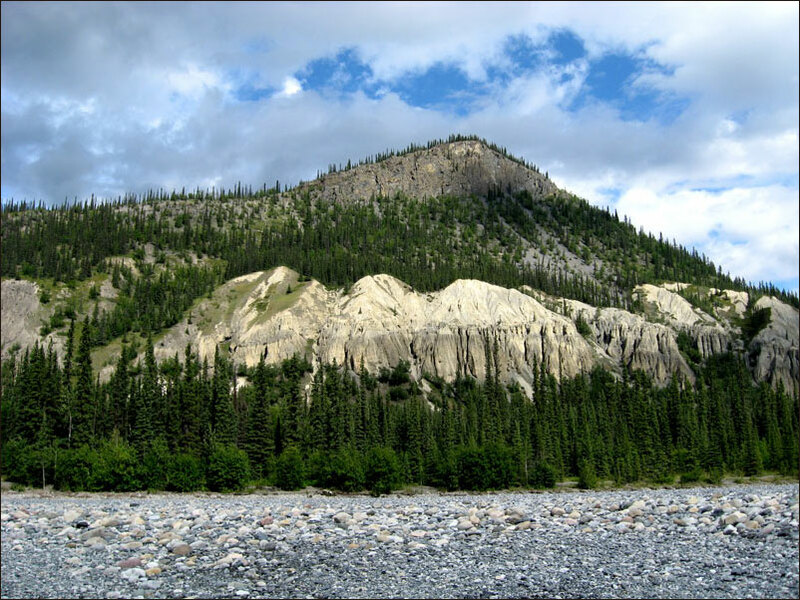 Yambadeja, a giant person held to be the protector of the Dene was said to use the tufa mounds as his dinner plates. 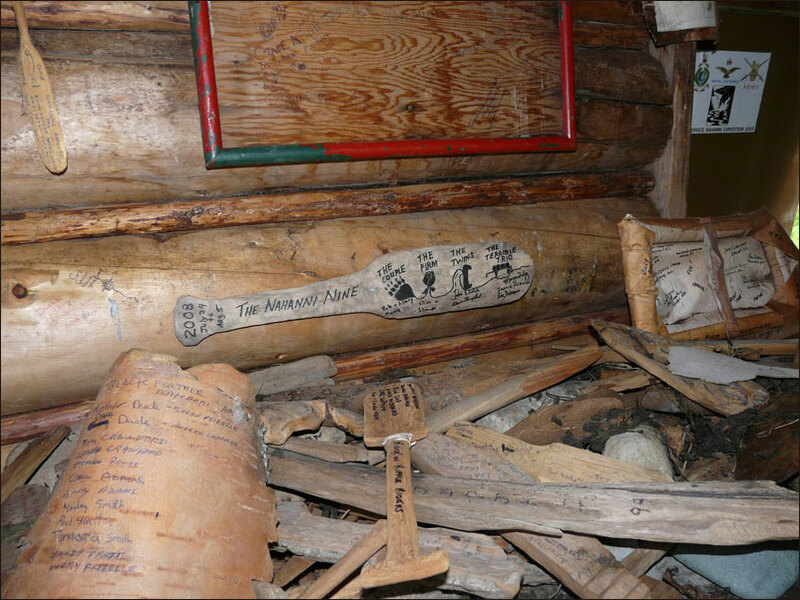 The Dene would often leave gifts such as tobacco and matches at Gahotháh (Rabbitkettle Hotsprings) to bring good luck. The Dene said that as long as the kettle was overflowing it was a sign of good luck, but if the kettle was empty, it was a sign of bad luck. 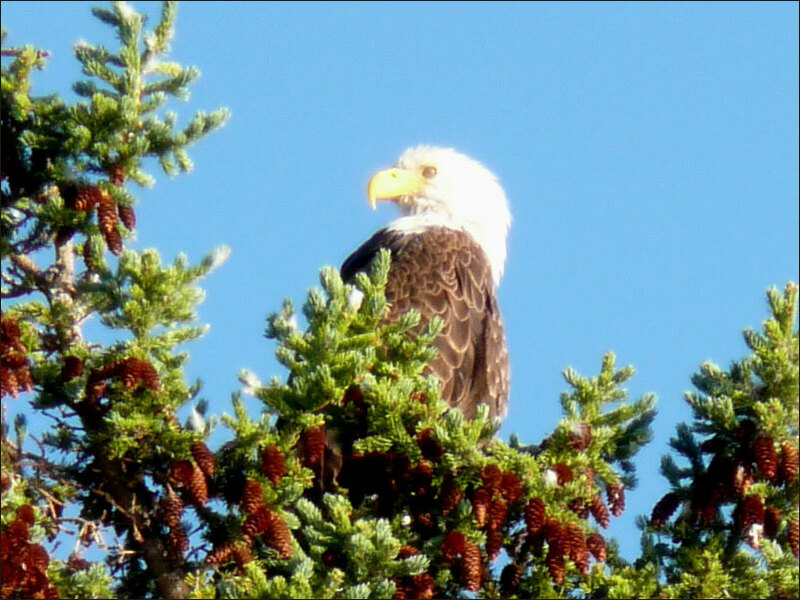 An eagle watched us from across the lake. 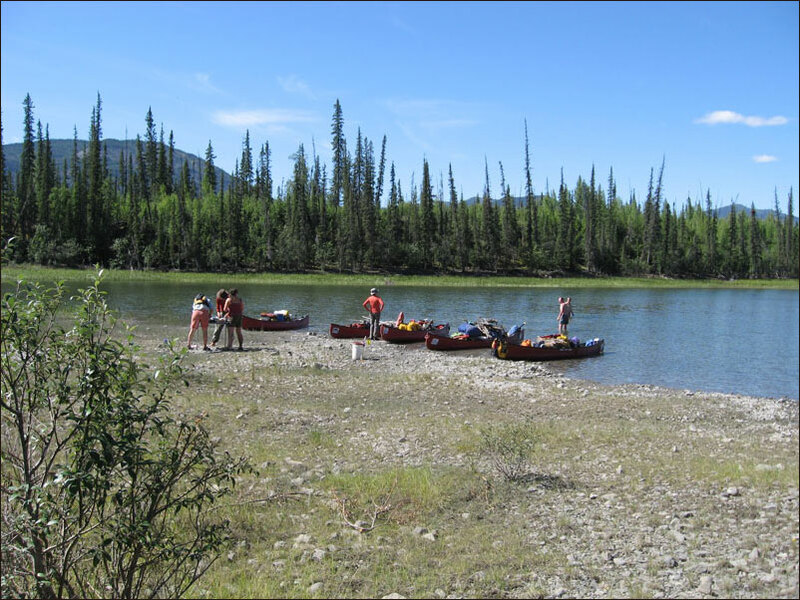 We packed up and paddled to the end of Rabbit Kettle Lake, where we did a drag portage for about 100m and wended our way down a shallow creek to the Nahanni River. The river clips along at about 12 km per hour here. 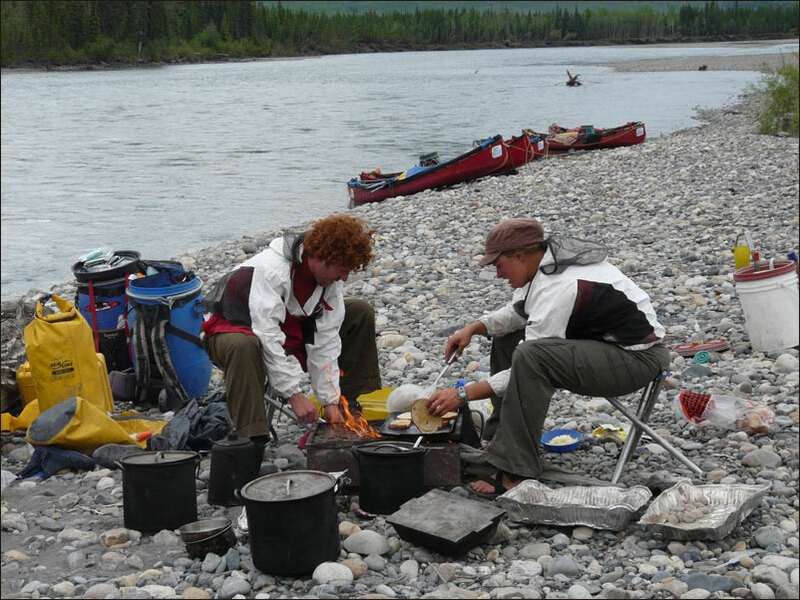 A short crossing brought us to our first camp on the river. 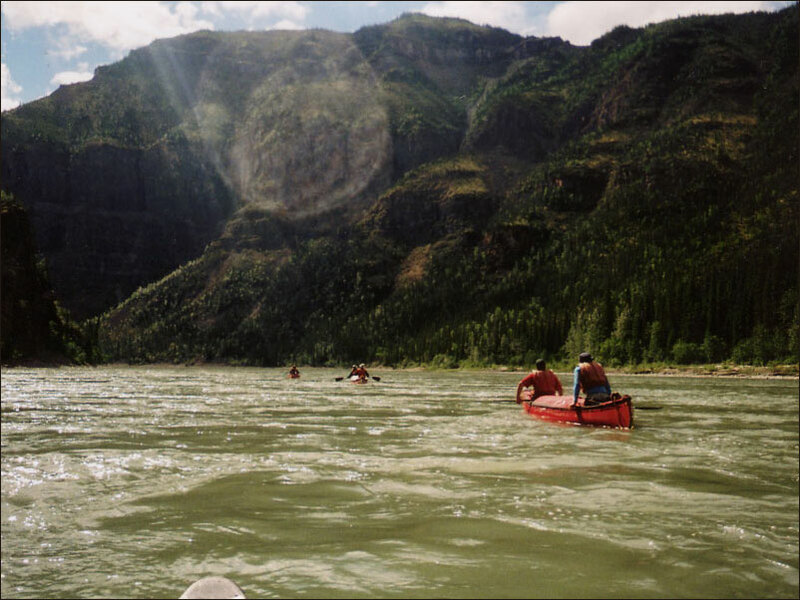 After setting up camp, the guides checked out our paddling skills and pronounced us ready for the river. 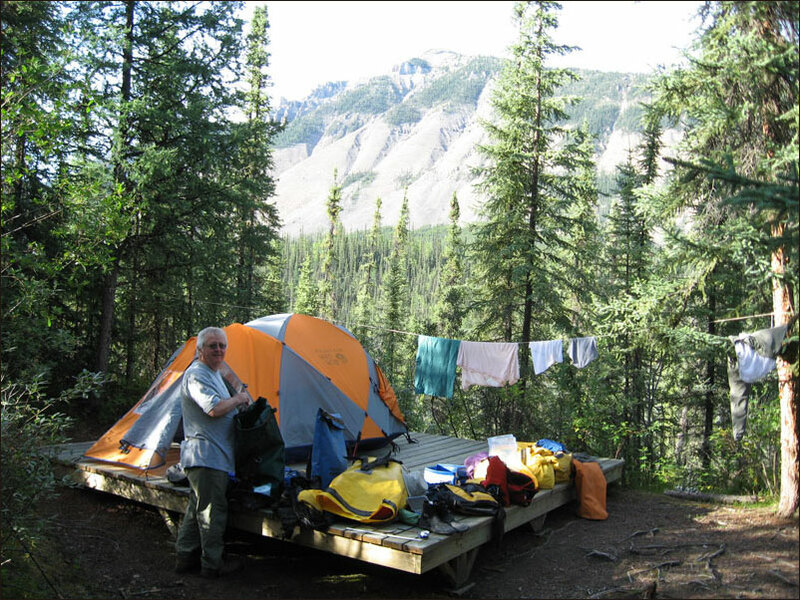 This is the Parks Canada food cache system. An after dinner discussion on 'bush etiquette'. 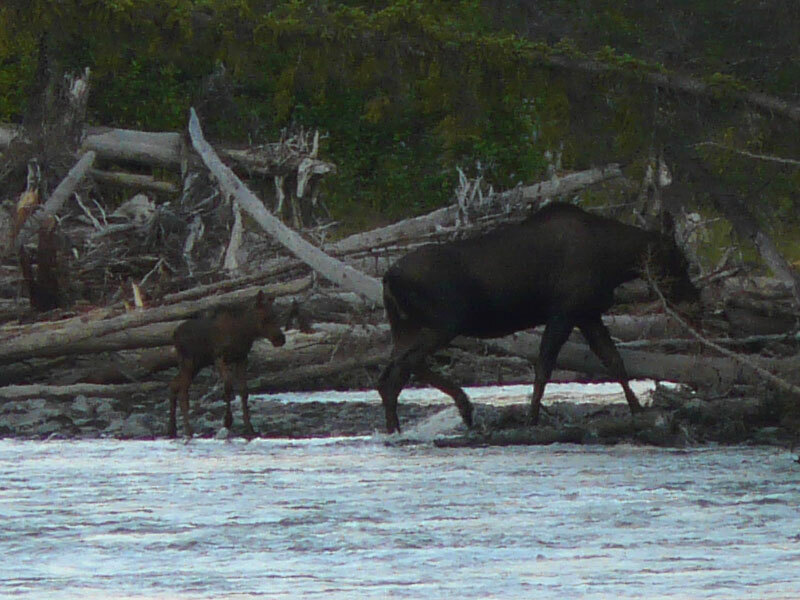 As we were finishing supper, a moose cow and calf entered the river from right behind our tent. We were a bit concerned that the calf would not be able to handle the current, but it survived the crossing. 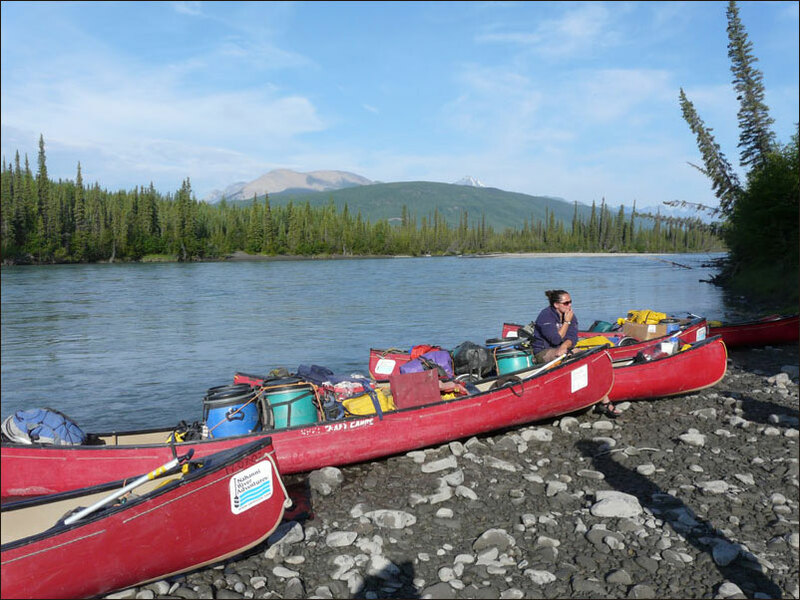 The level of luxury provided us is easily seen by the amount of gear in the canoes! 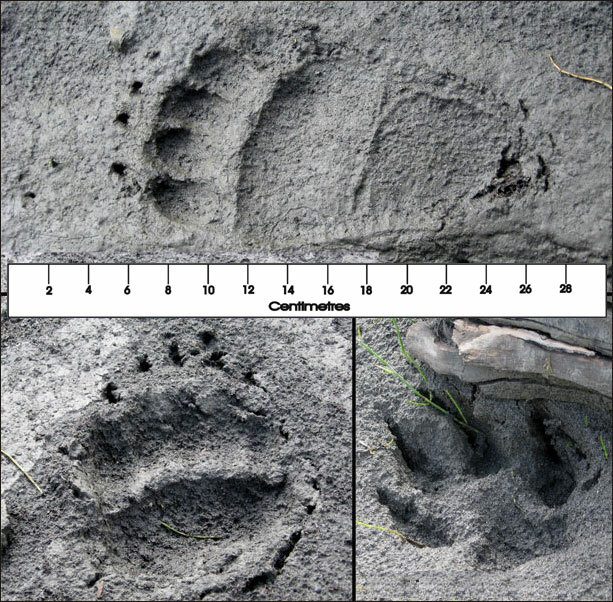 Bear and wolf tracks in the sand along the shore reminded us that we were not alone. 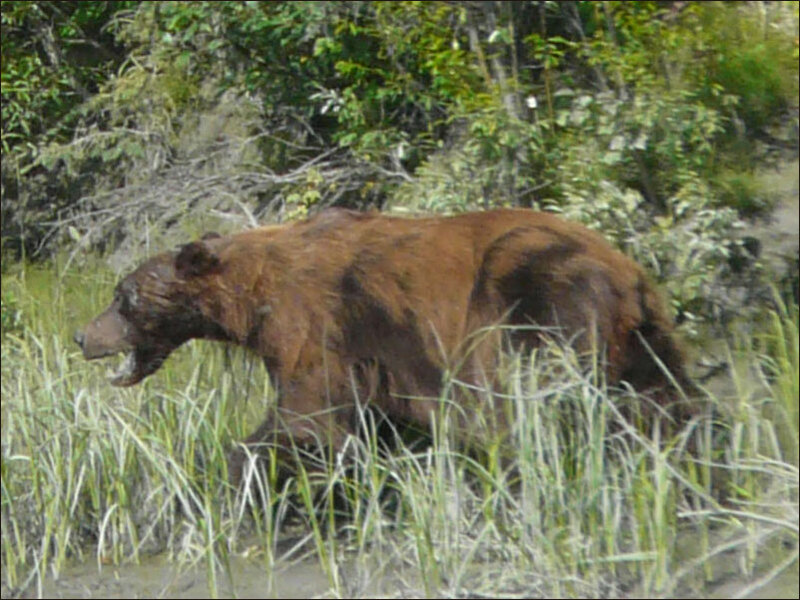 This grizzly, although aware of us, seemed unconcerned. It was about 100m away from our flotilla. 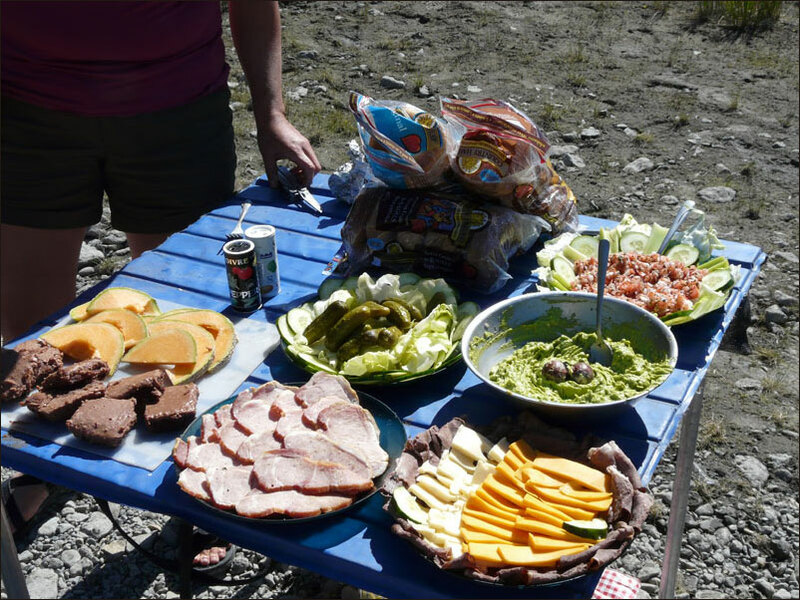 Gravel bar lunches would become the norm. Dave tried fishing, but had no luck. The water was probably lacking in nutrients that would sustain anything worth catching. We got hit with a rain & hail storm in the afternoon. A rainbow later on made up for the discomfort of the hail. Tonight's camp was a sandy, comfortable spot. 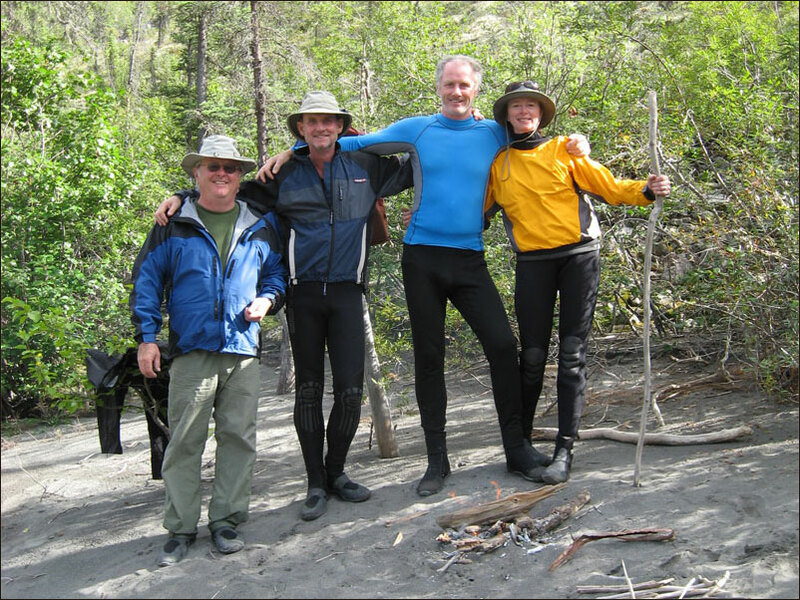 The Hoodoos showed us differential weathering for quite a stretch along the river. 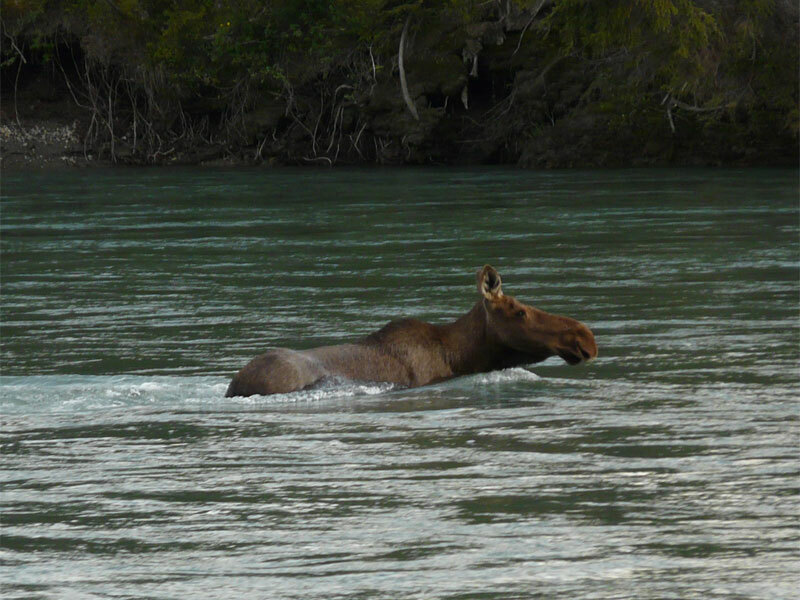 We deked into an oxbow to see if we could see moose. 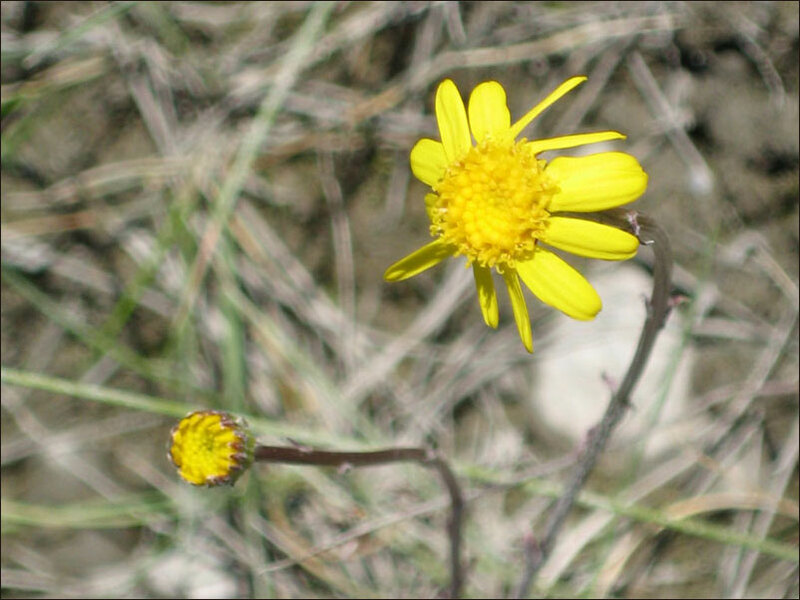 There was a great variety of flowers in the oxbow (relatively still water resulted in a nutrient accumulation). 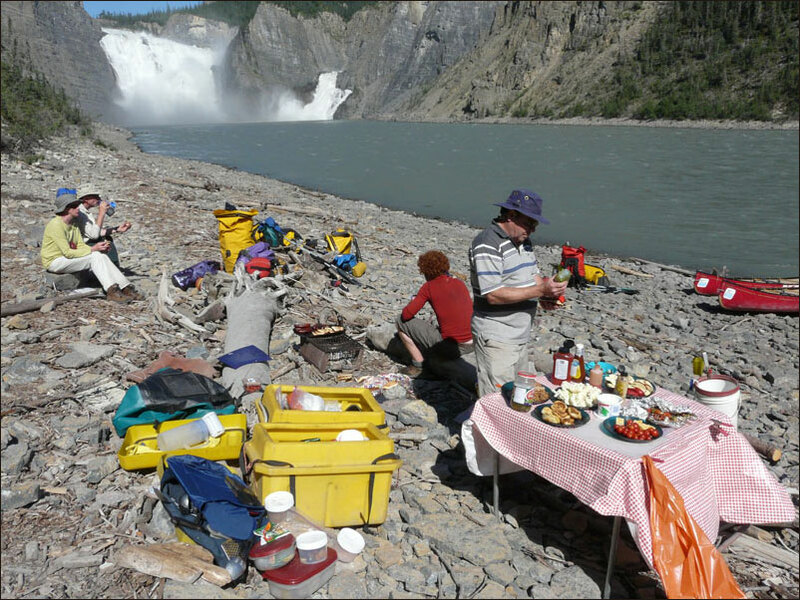 Our guides once again provided us with a high end lunch! 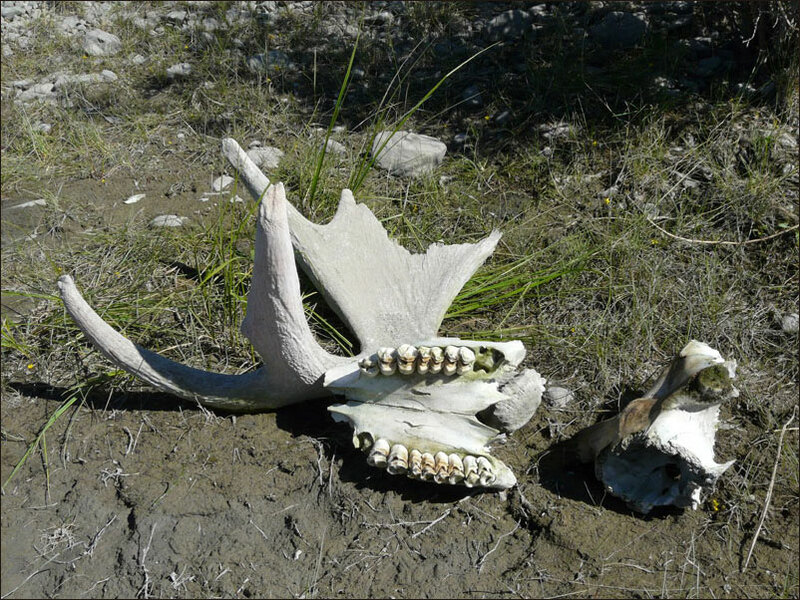 Even though we did not see a live moose, there was evidence that they did frequent this area. After lunch, Dave caught 3 fish in the oxbow. 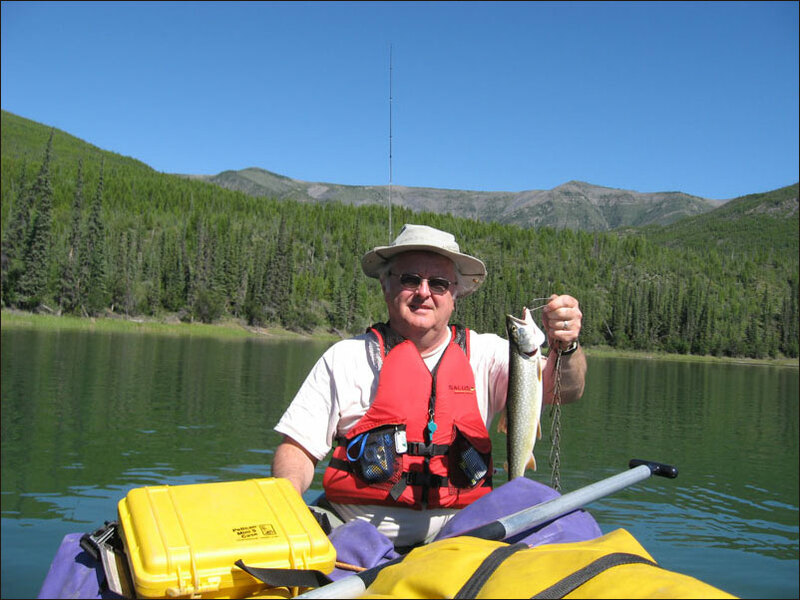 He was only able to hang on to one - a lake trout. What a classic canoe photo! We ate Dave's Lake Trout as an appetizer for dinner, cooked in butter and garlic. Delicious! 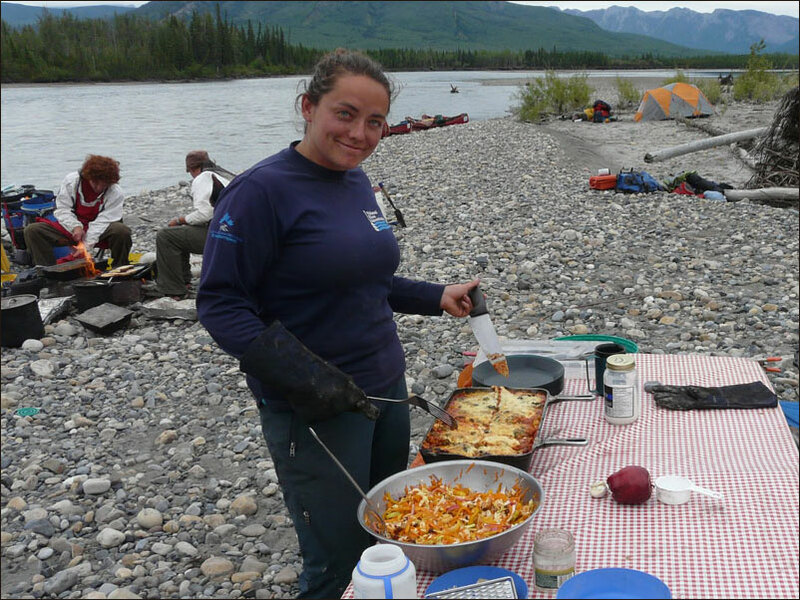 Our chefs/guides made amazing meals! 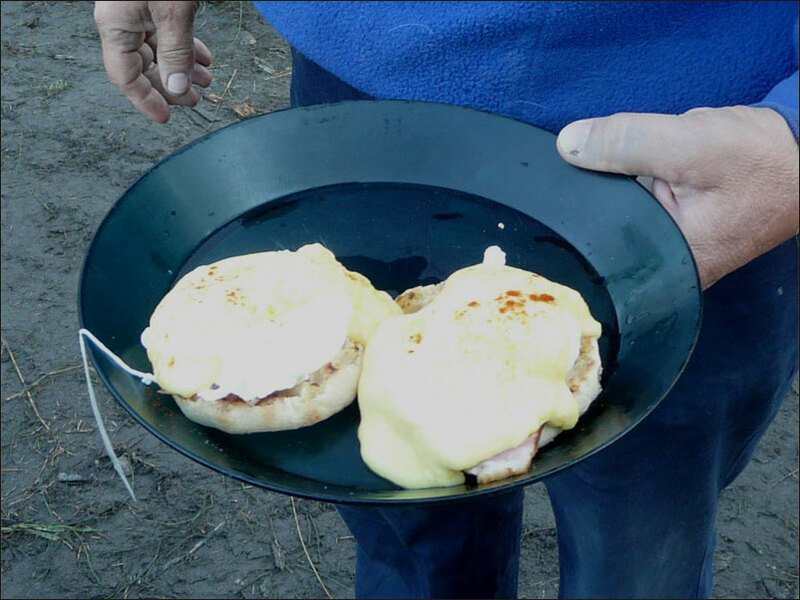 Breakfast was 'Eggs Benedict' !! The park station at Virginia Falls included float plane docks, boardwalks and rather elaborate food caches with pulleys. 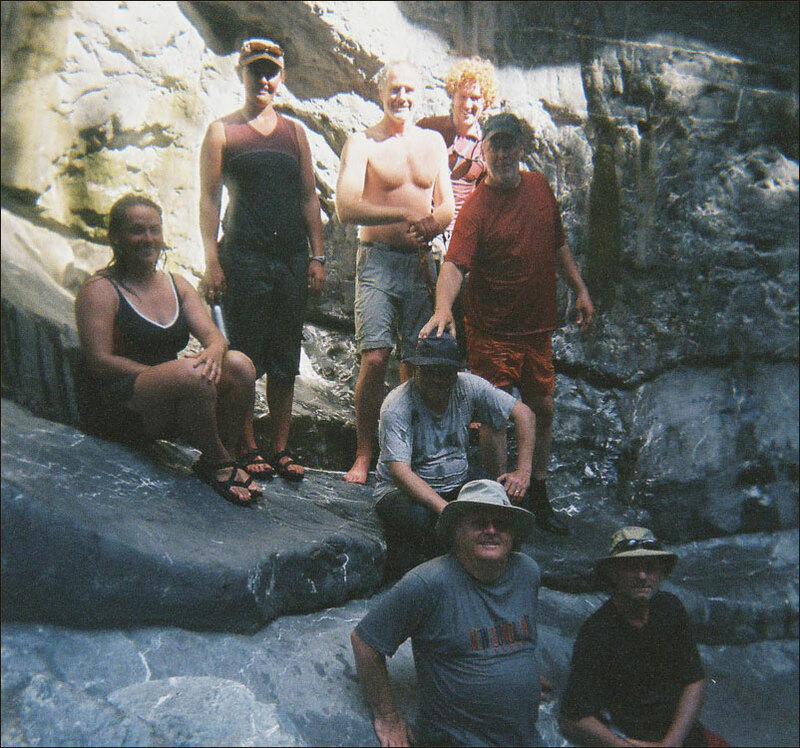 Part of our group hiked up Sunblood Mountain (about 14 km round trip) while the rest had a look at the falls. 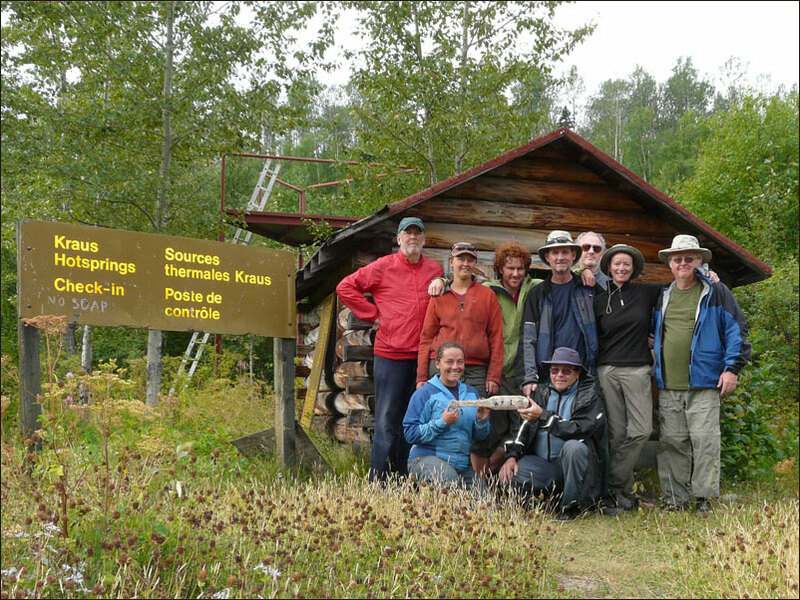 As well, the Parks Canada wardens held interpretive sessions involving aboriginal trapping and trade methods and stories about Dene legends from the area. 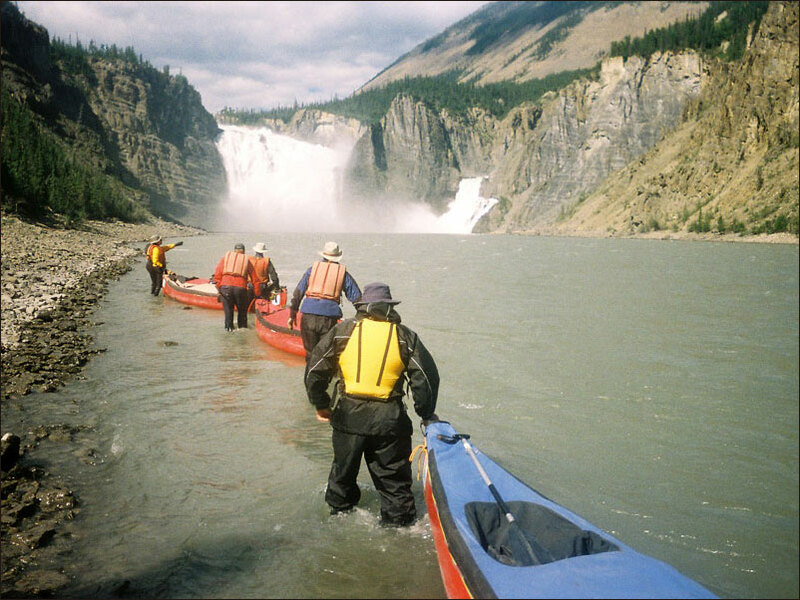 While this was happening, our guides portaged the gear across the 1.5 km stretch to below the falls. It took 7 or 8 trips over the day and a bit that we were at the falls. 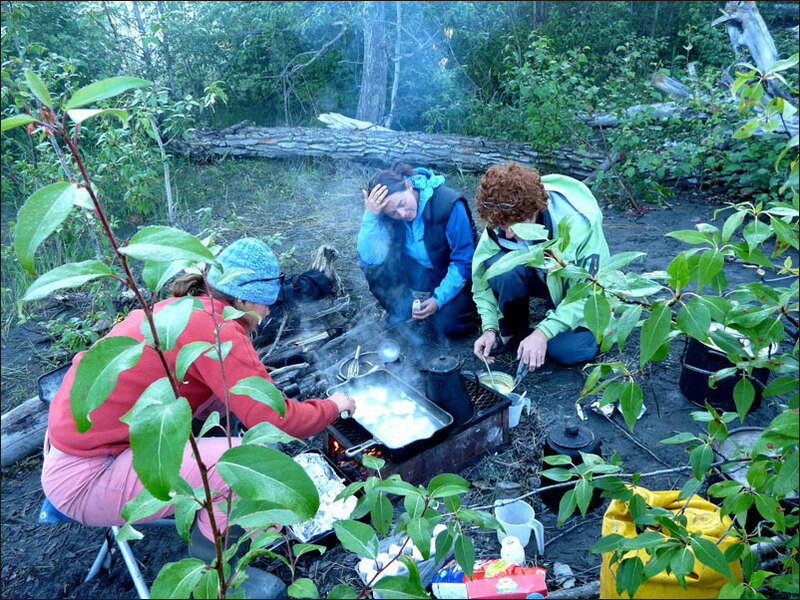 Despite doing all that work, the guides were available to make meals for us. Incredible! To preserve the ground from misuse, all tents were erected on platforms. Looking down on Virginia Falls from Sunblood. Mason's Rock is the pointy bit. Sunblood was quite a hike, but the view from the top was worth it. 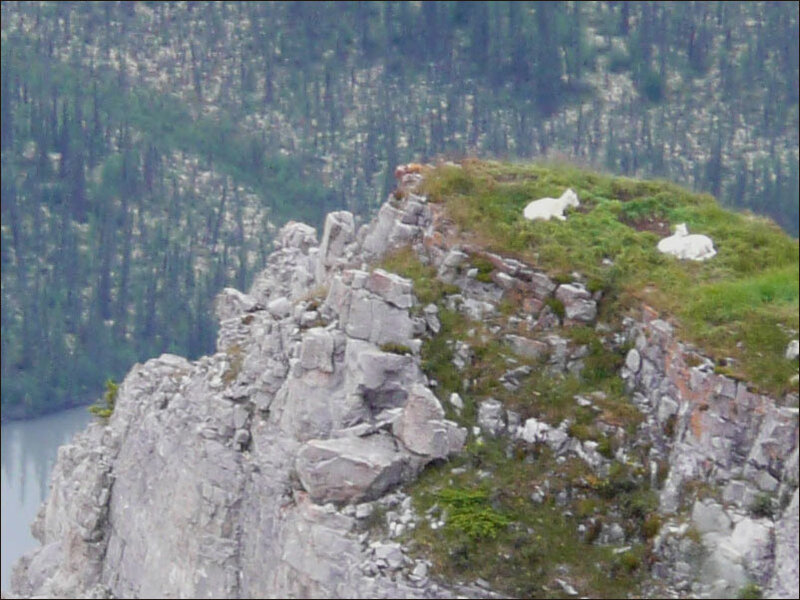 Dall sheep at the top of Sunblood. 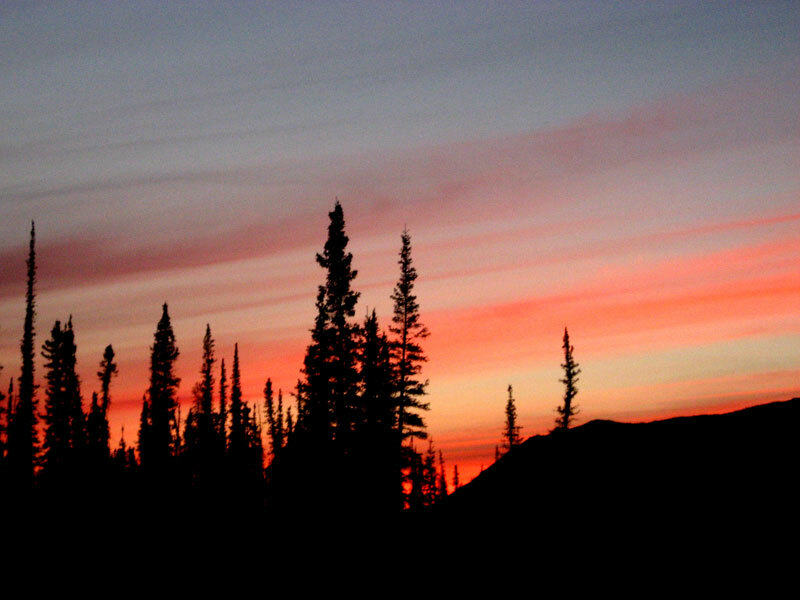 One of the few actual sunsets that we experienced was here. 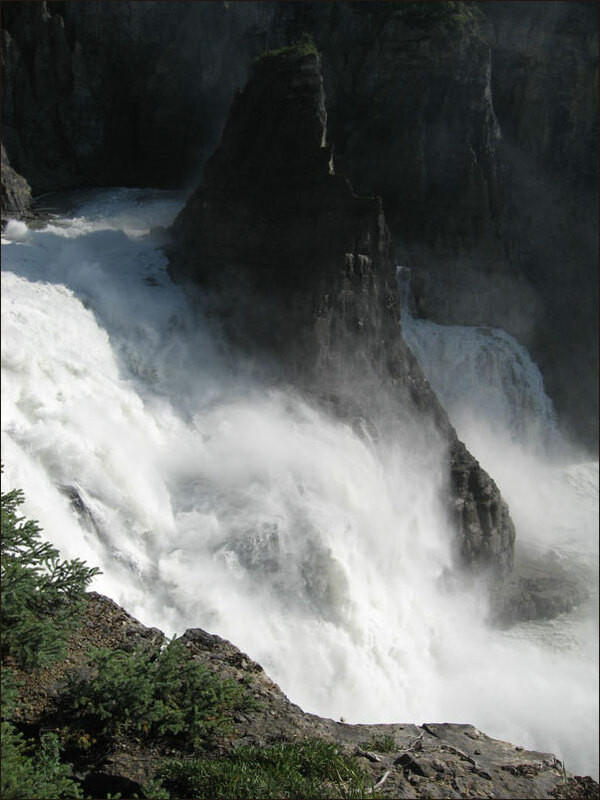 Virginia Falls is an icon of the northern Canadian wilderness. 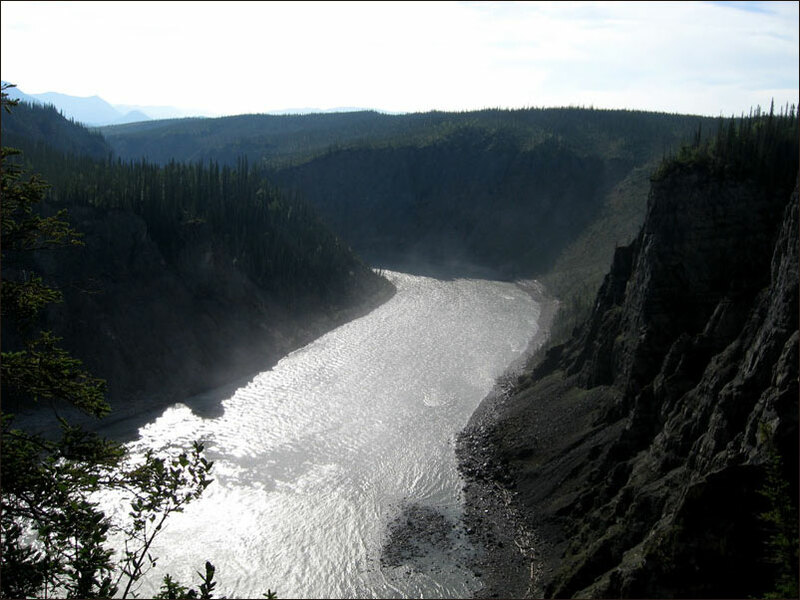 Although there are other cataracts that may be equally spectacular, Virginia stands out due to being part of the Nahanni River. It is twice the height of Niagara and to us, just as impressive. 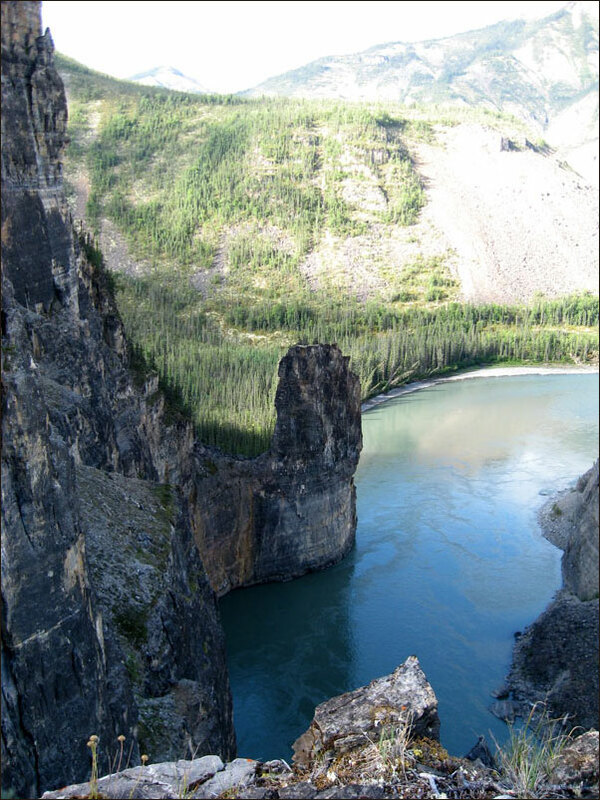 The drop here makes up a fair bit of the overall drop of the Nahanni from Rabbit Kettle to the Butte. 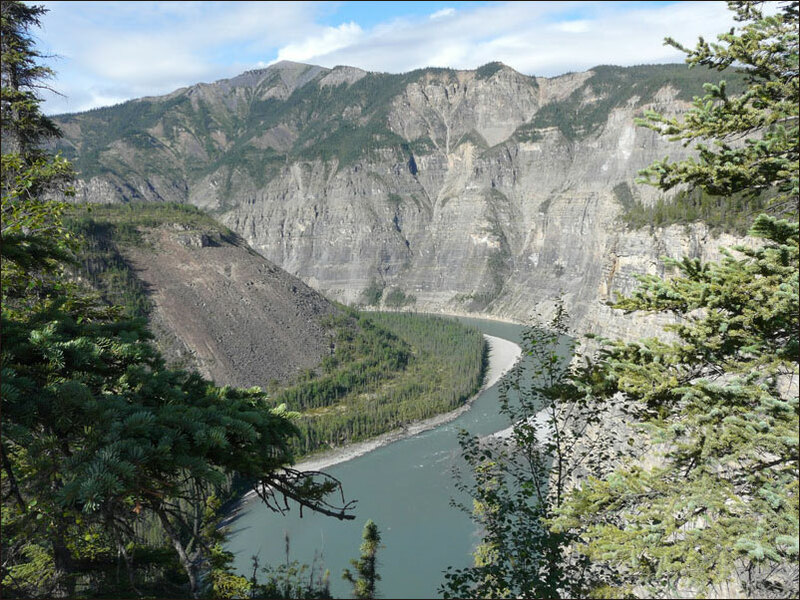 The presence of a Parks Canada facility here serves to strongly support the preservation of the Nahanni ecosystem, including all of the watershed. Virginia Falls starts at the Sluice Box, where the current gathers for the plunge. 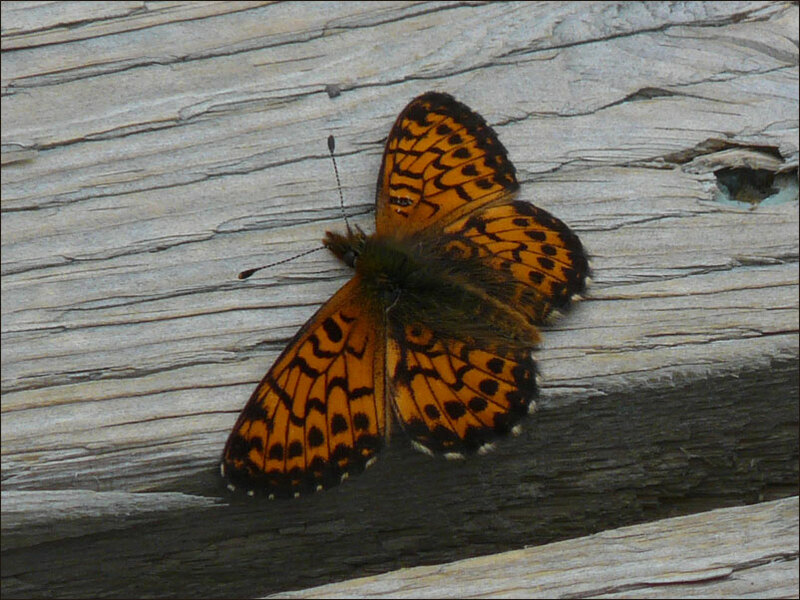 As a counterpoint to the power and majesty of Virginia Falls, we saw a number of fritillaries around the camp. The view from above the falls gives an idea of the drop. An assist to the 2 km (approx.) portage around the falls was a custom wheel barrow. The portage was still quite arduous. 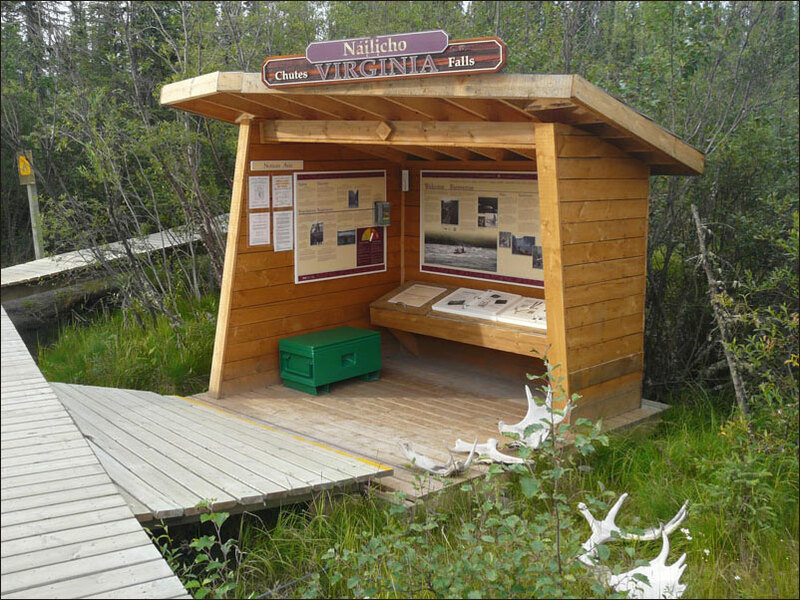 The information on this plaque attests to the significance of the Nahanni River system. 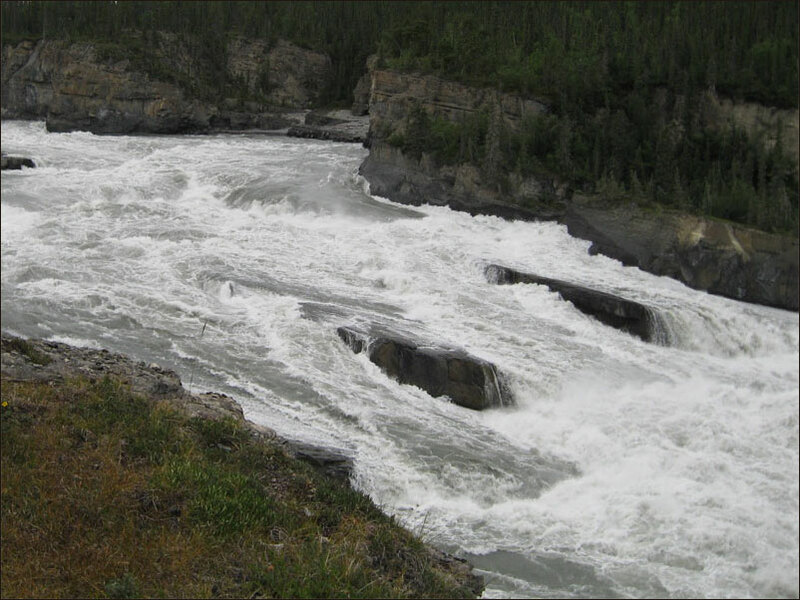 We put in below the falls with the knowledge that rougher water awaited us in Fourth Canyon. At this distance, it did not look too challenging. The canyon walls were 'gorge'ous! Just around the corner were 5 foot volume waves! One of the canoes dumped. One of the paddlers managed to get out of the strong current, but the other did not. 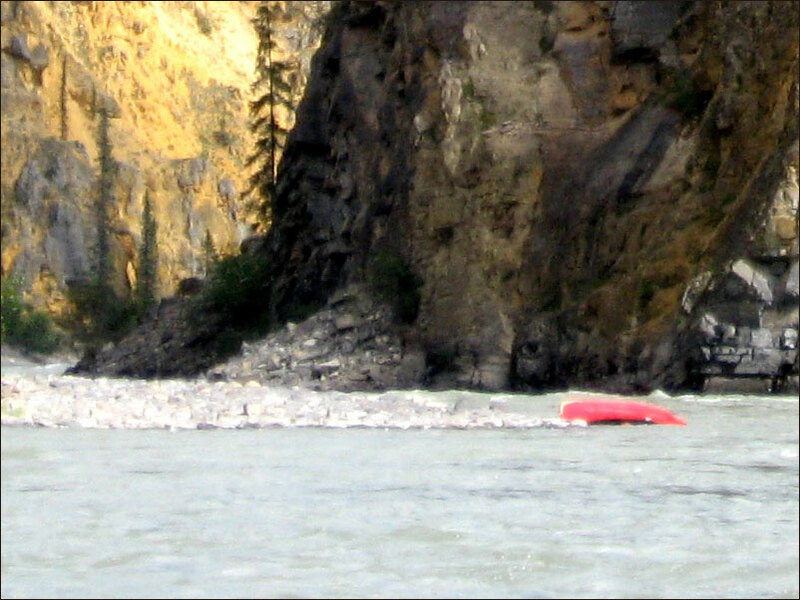 He floated about 2 km downstream before he could be pulled ashore, where one guide stayed with him. Knowing that the 'floater' was in good hands, we built a fire to warm up our rescued member and organized a pick-up game of Bocce with the available rocks. 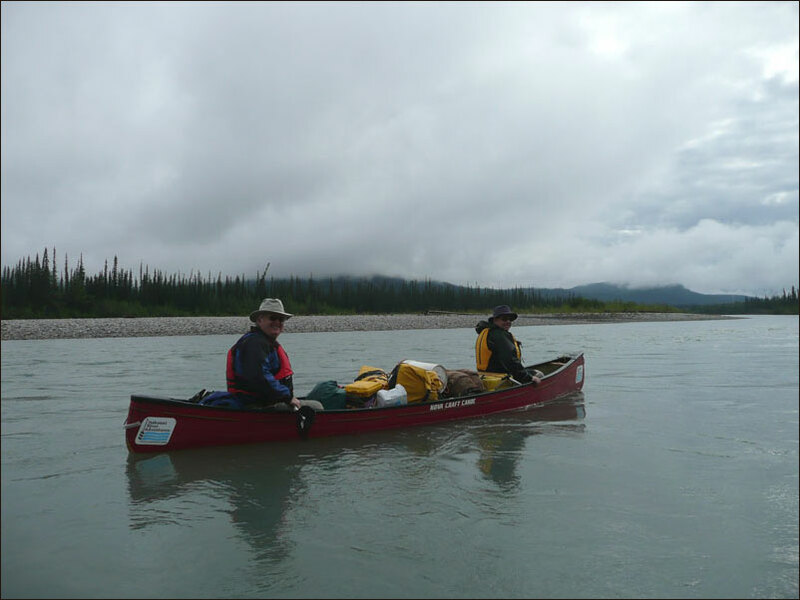 Two of the guides bushwhacked back to us on the opposite side of the river and refloated the dumped boat. The guides did an amazing job, considering the circumstances. The canyon gave way to sandstone bits that were . . .
. . . hoodoo wannabees. The camp at Marengo was flat and bug free. 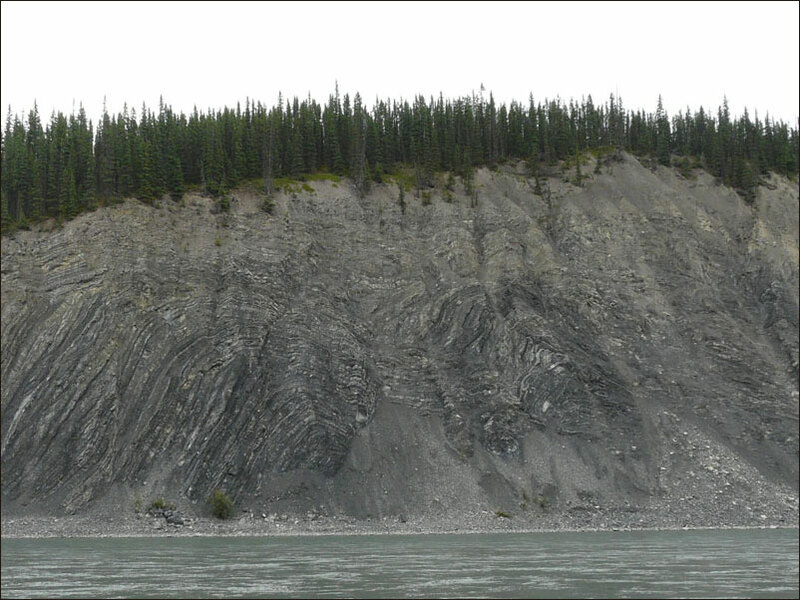 The sedimentary layers are quite contorted along this river section. Another unspoiled look back up river from the Gate. The Gate is a narrowing of the river, but because of the depth, there is no turbulence. We pulled in upstream of the Gate and made camp. We were promised a climb up the cliff on the left (about 700 feet above river level) and an unforgettable vista the next day at the top of the Gate. Almost to the top. We rested our knees. Our canoes can be seen mid right, along the shore. Up close and personal with the other side of the Gate. As promised, an unforgettable vista! We bid adieu to the Gate. And paddled through Second Canyon. The canyon walls were higher than the previous canyons. 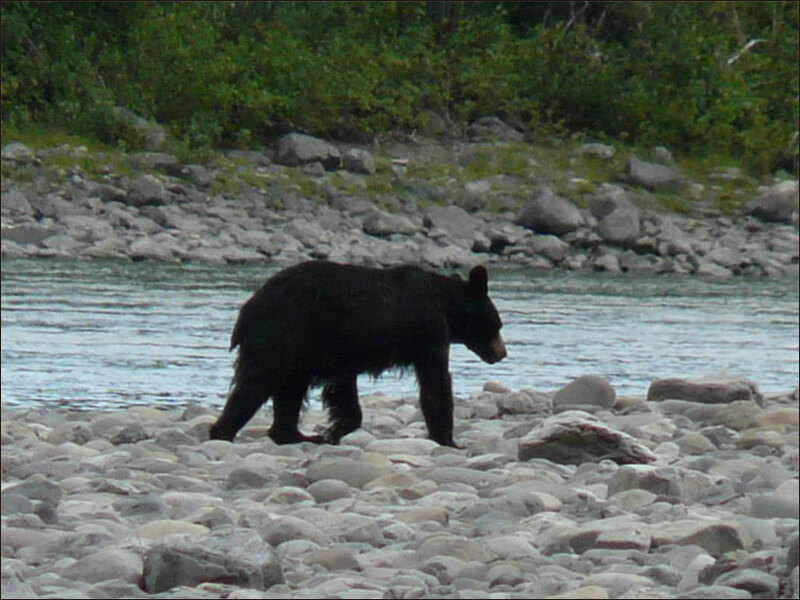 As we were setting up camp, a black bear wandered by. Looking down river towards Deadman Valley. 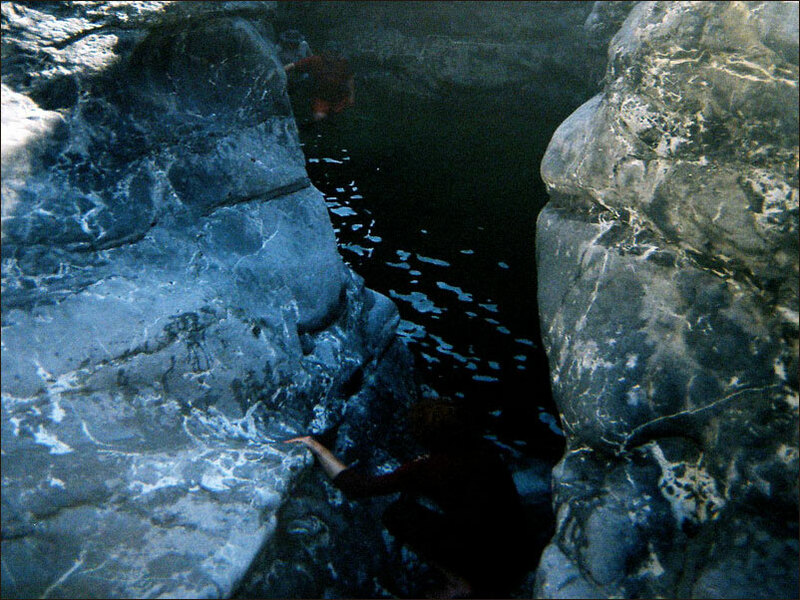 This camp was along a 'snye', which allowed us to swim and enjoy the sun's passage across the cliffs. 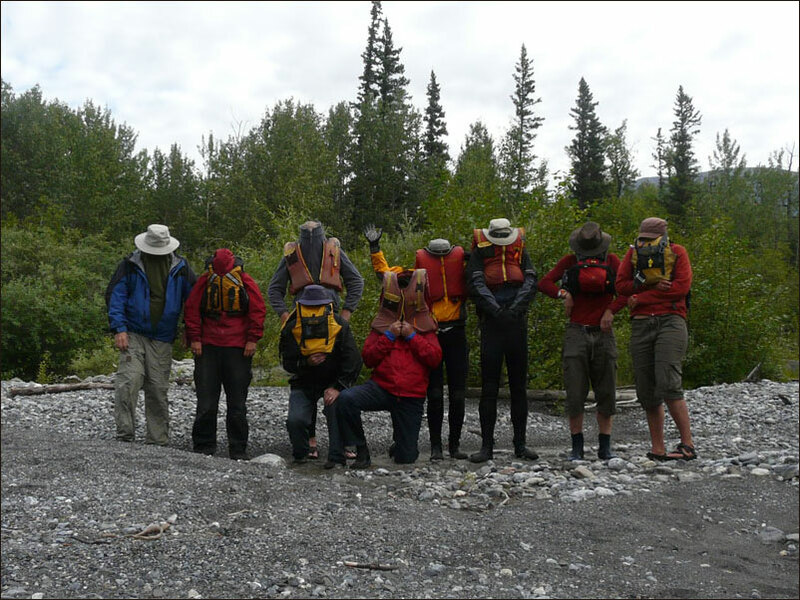 We stopped at Headless Creek in Deadman Valley. George's Riffle, which sounds rather innocuous, was actually quite challenging. The beginning of the Headless Range. First Canyon is just ahead. Lunch stop - another great view. White Spray Spring was a stop along this section. The water flowing out of the canyon wall was purely delicious! 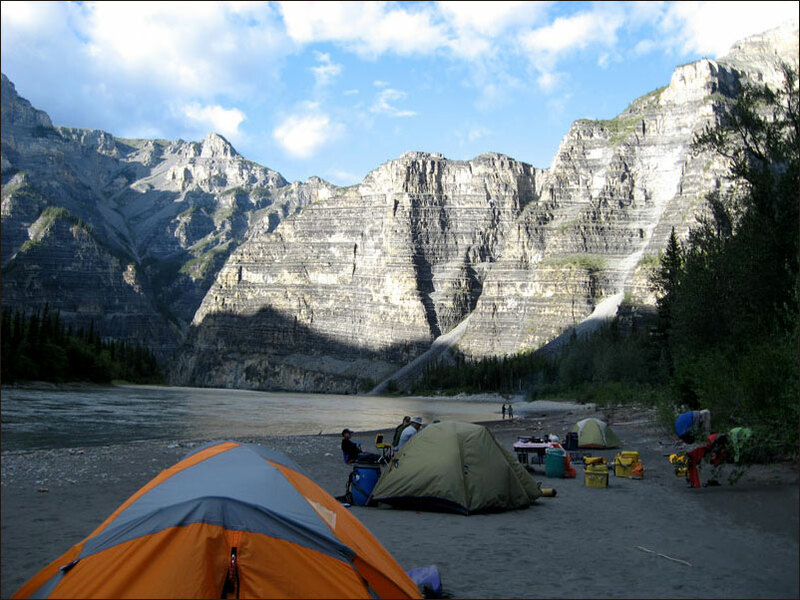 The campsite chosen as a "5 star" was indeed an excellent location. A black bear also realized the quality of this site for the duration of our visit, but did not bother us. The visual input is almost too much to handle! 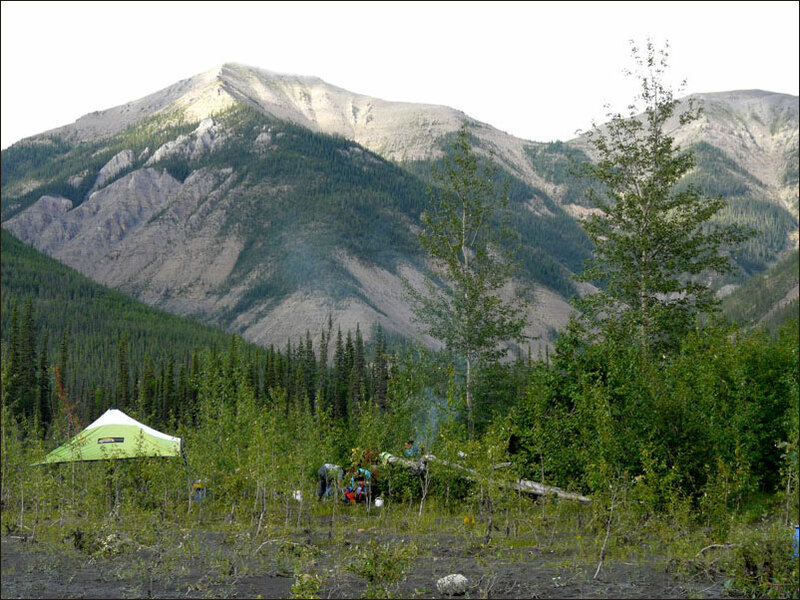 This is a view upstream from the camp. Jamie and others created a sauna for the evening. The canyon walls got higher in 1st Canyon. We hauled onshore early at Lafferty Creek. It was the hottest day thus far. Behind the camp was a valley which, according to the guides, was worth hiking the next day. After about an hour's walk under the sweltering sun, we arrived at the "Chasm of Chills". 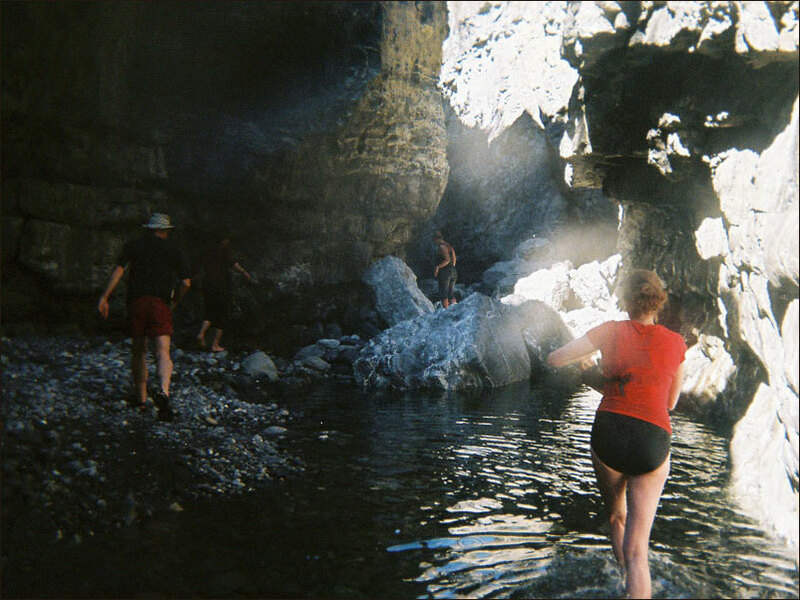 Access involved several swims through narrow walled stream routes containing water which was slightly above the freezing point. Peer pressure and the triumph over the elements convinced our entire group to subject themselves to the experience. Even though the swim was brutal, it was worth it when we got to the end and could appreciate the sun warmed rocks. 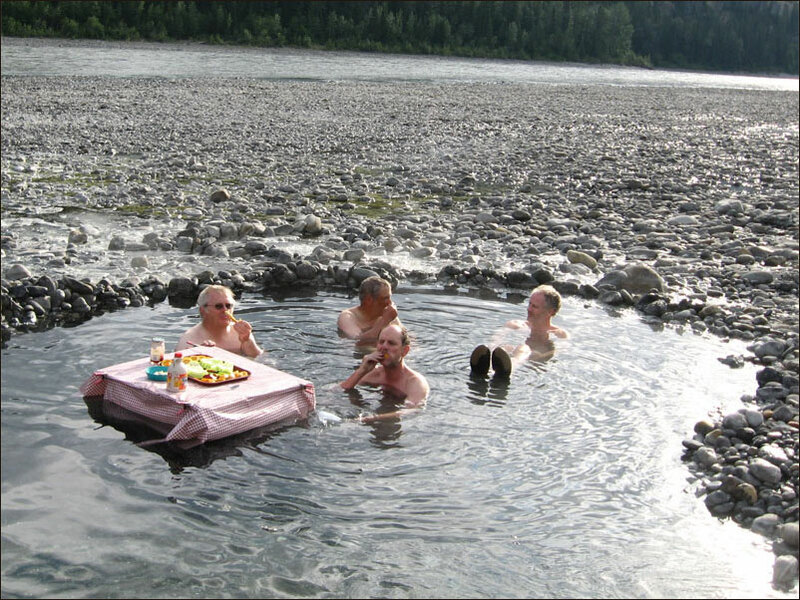 After a quick pack up, we paddled to Kraus Hotsprings, where breakfast was served. 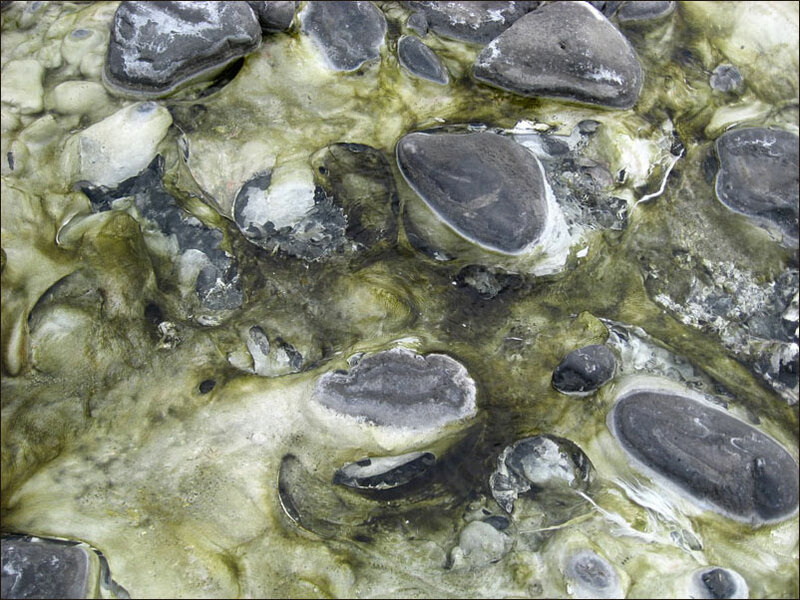 The out flow from the hot springs produces a fair amount of algae. As is the custom, we had made a paddle symbolizing our river experience. 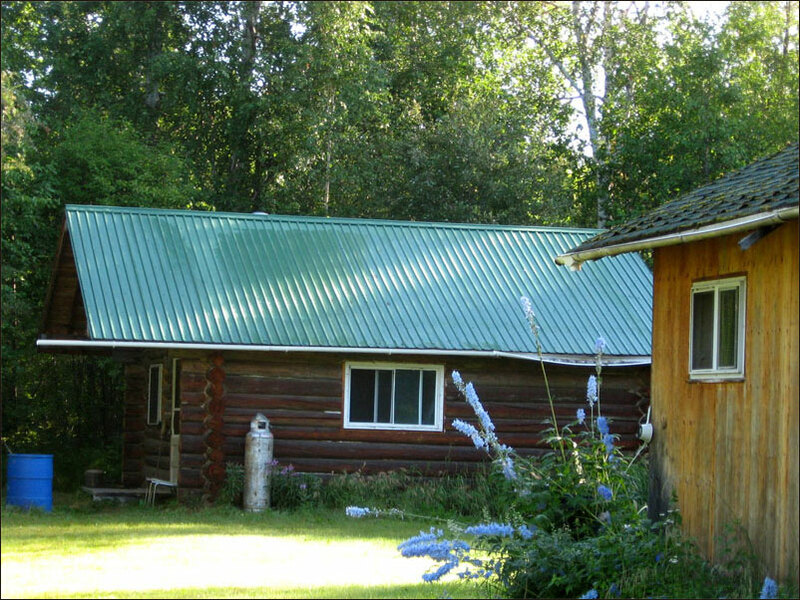 The cabin here contains paddles from almost every group that has done the river over the past twenty years. 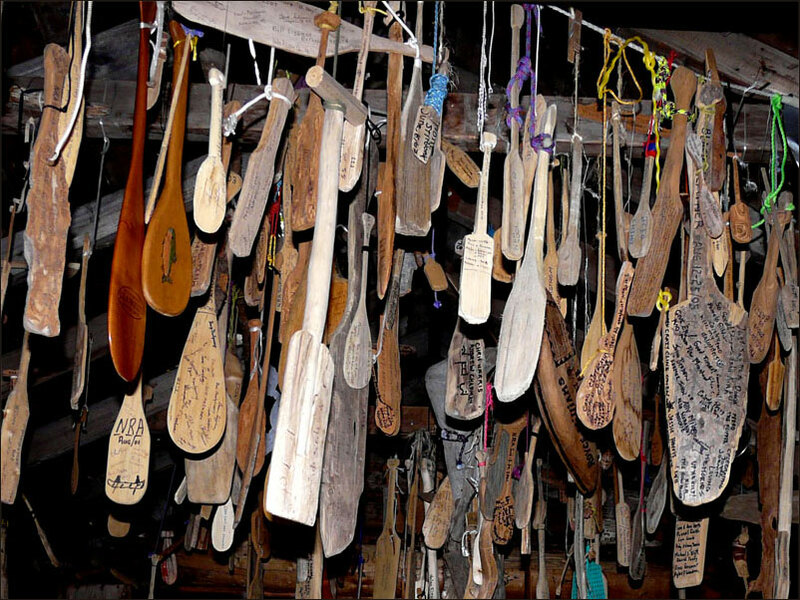 We placed our paddle in with the many others that adorned the cabin. 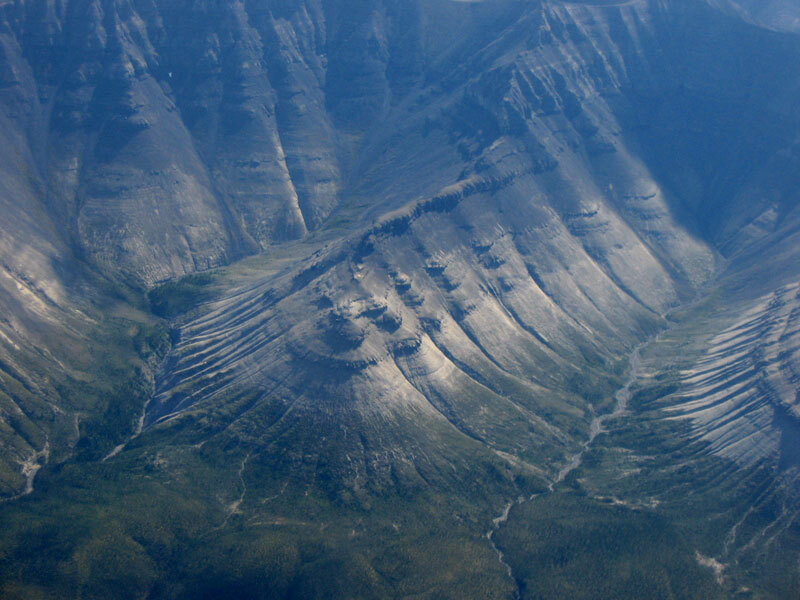 After the vertical topography, the splits is a dramatic change. The water, although still moving along appreciably, is muddier. Our chefs continue to deliver outstanding meals. A spinach lasagna was today's treat. 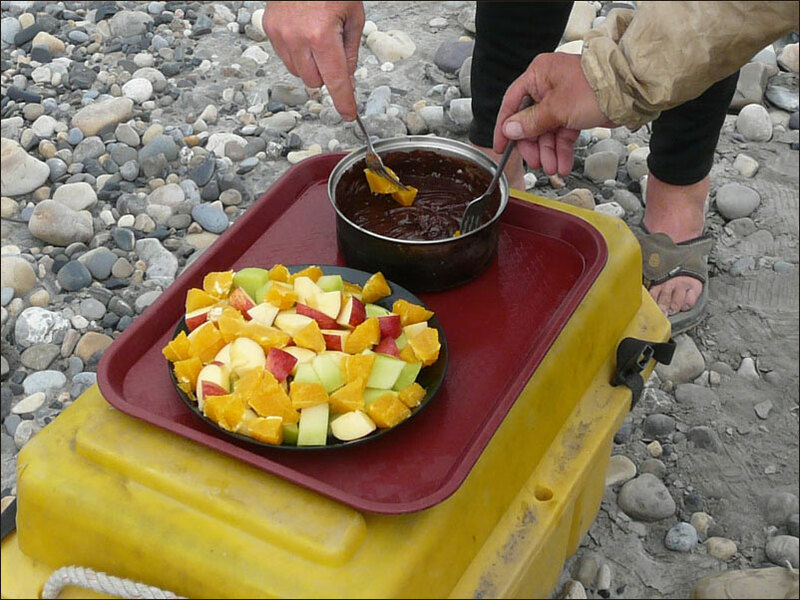 Another decadent dessert - chocolate fondue! 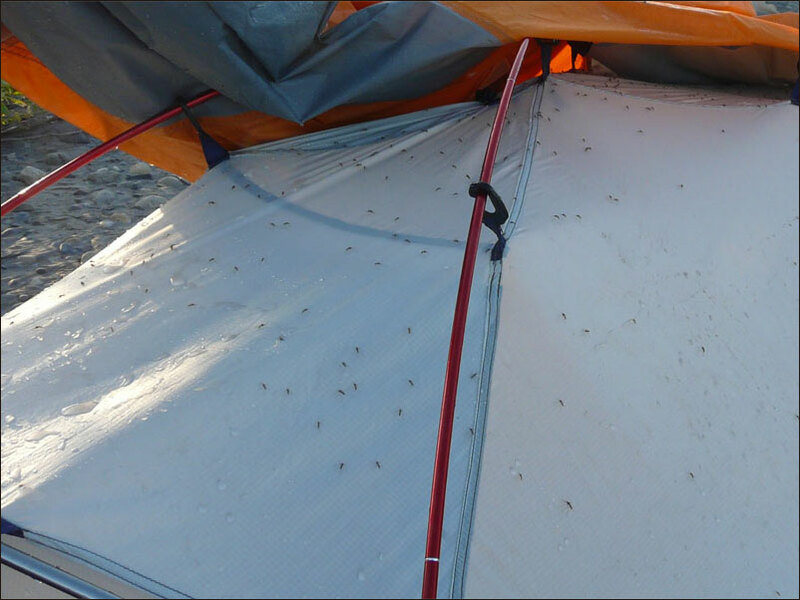 For the first time on the trip, we actually had lots of mosquitoes. Thankfully, they waited until now to 'bug' us! 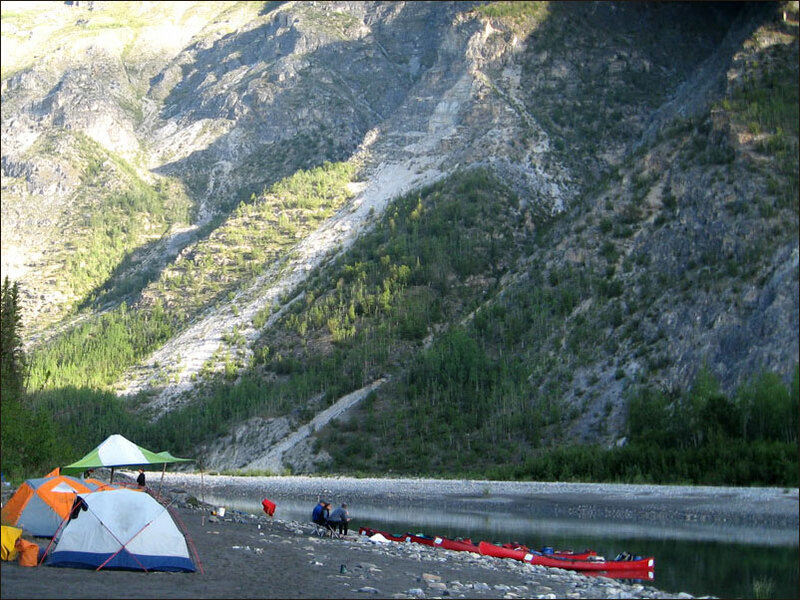 Our last river campsite was flat as befitting the splits - meandering with no discernable waves, but with measurable current. The heights are much farther away now. 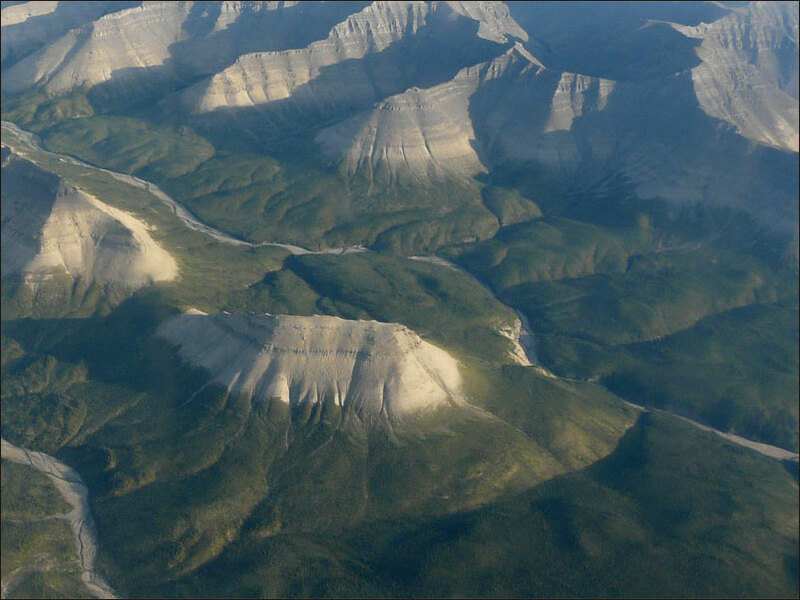 Nahanni Butte beckons on the right. Twisted Mountain was a last shot at the layers that we had seen in the canyons. Tectonics at its best! 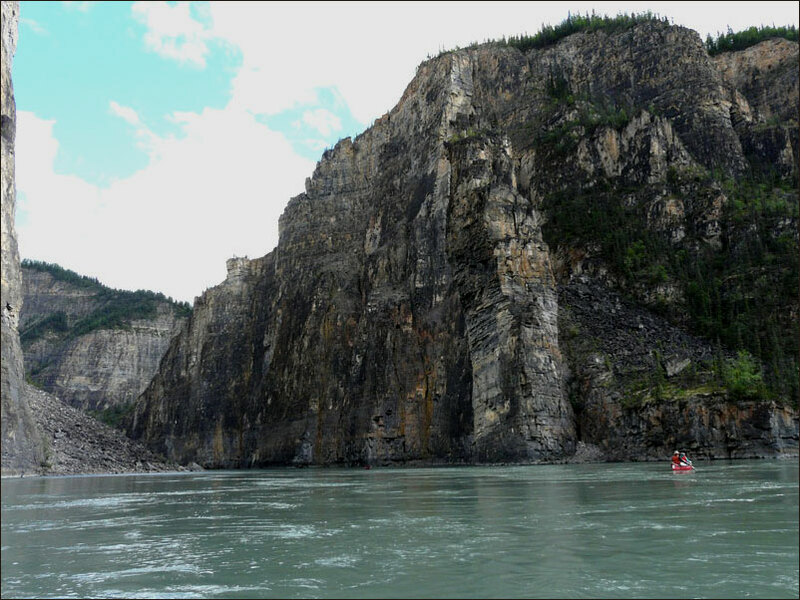 During our morning paddle, Nahanni Butte has been the dominant structure in the landscape. 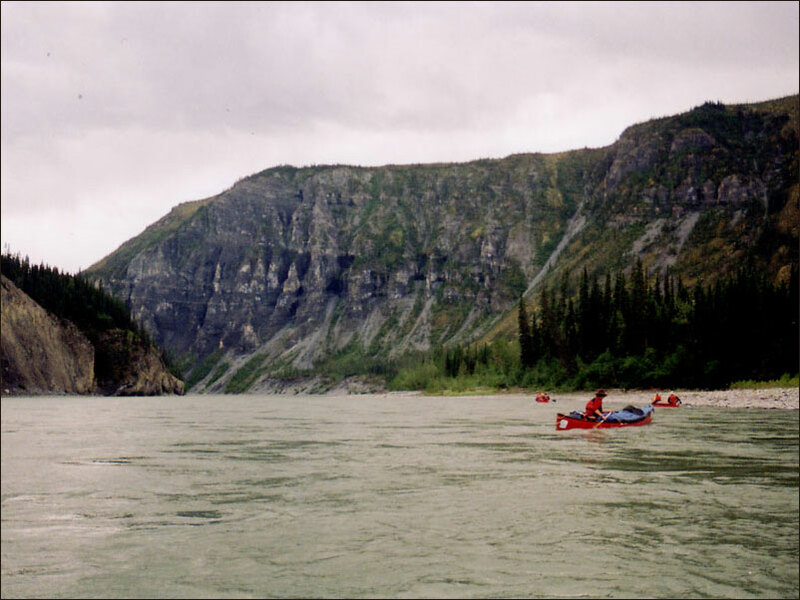 We pulled in at the town of Nahanni Butte, ate lunch there, and transferred our gear to a motor boat 'taxi' for the trip to Lindberg's Landing. 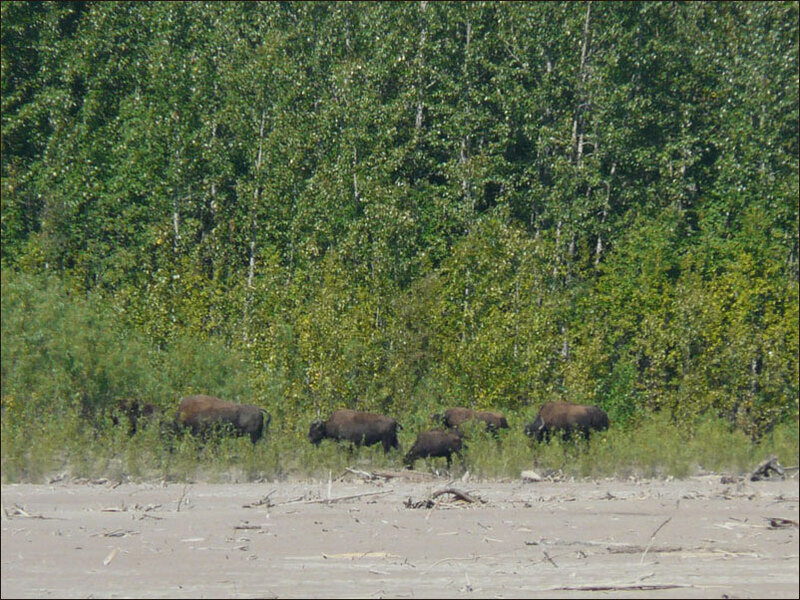 On our way to Lindberg's, we saw a group of Bison along the shore of the Liard River. 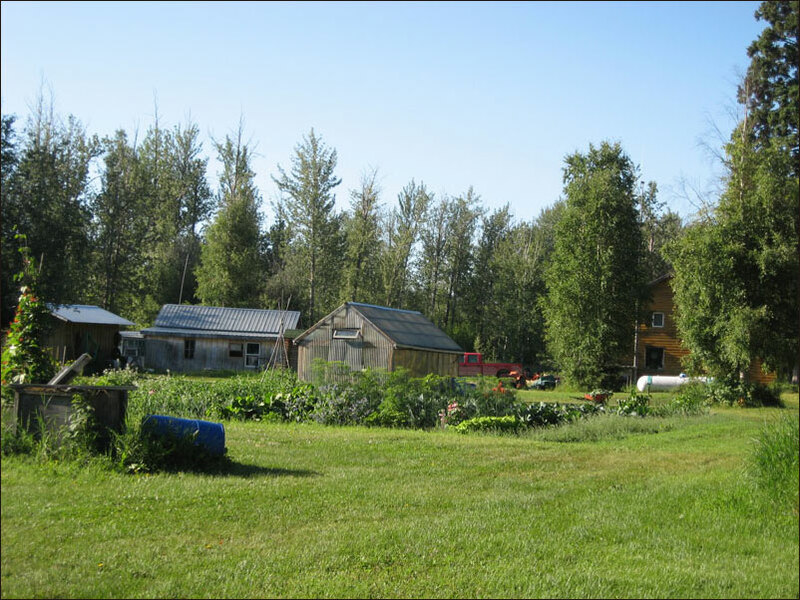 The Lindbergs have been homesteading here for decades. Sue made us very welcome and also provided us with an excellent supper and cold beer! We got hot showers, and spent the night in a really nice cabin. 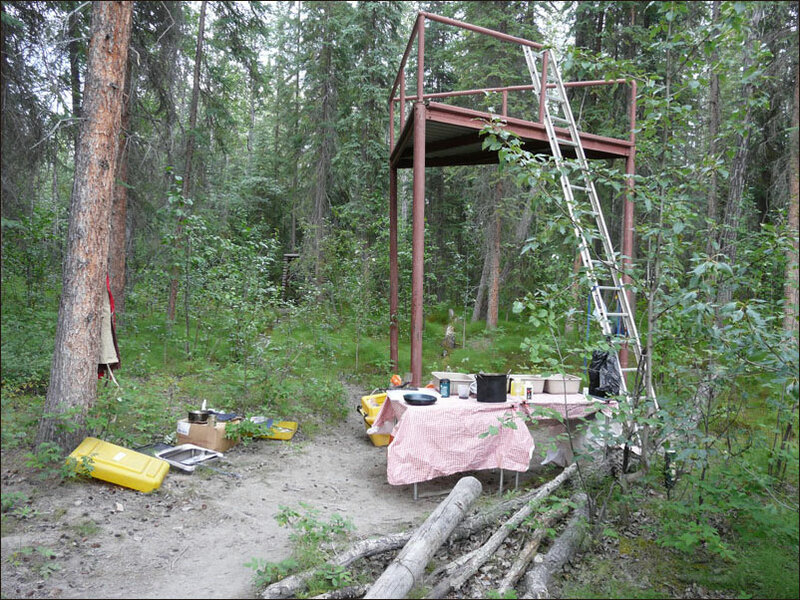 The mosquitoes found us again, which necessitated the use of netting. 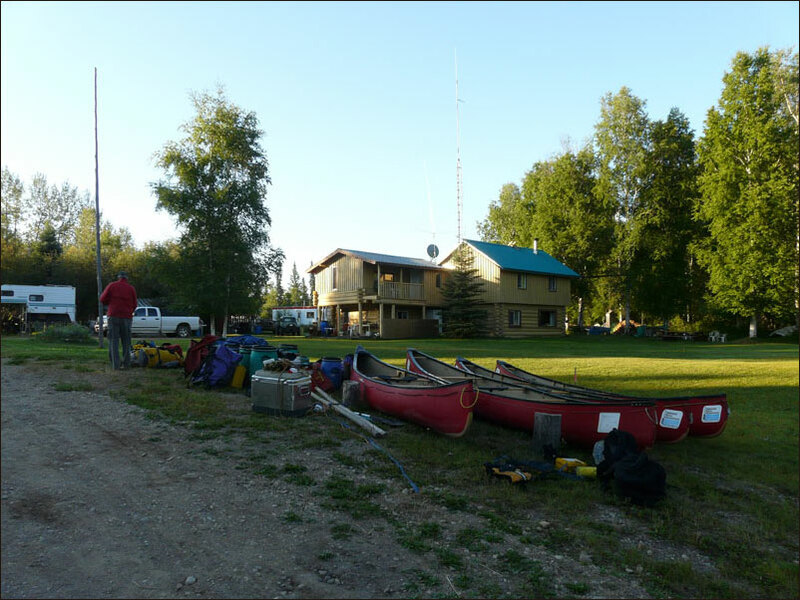 We readied our gear for the vehicle shuttle to Fort Simpson. 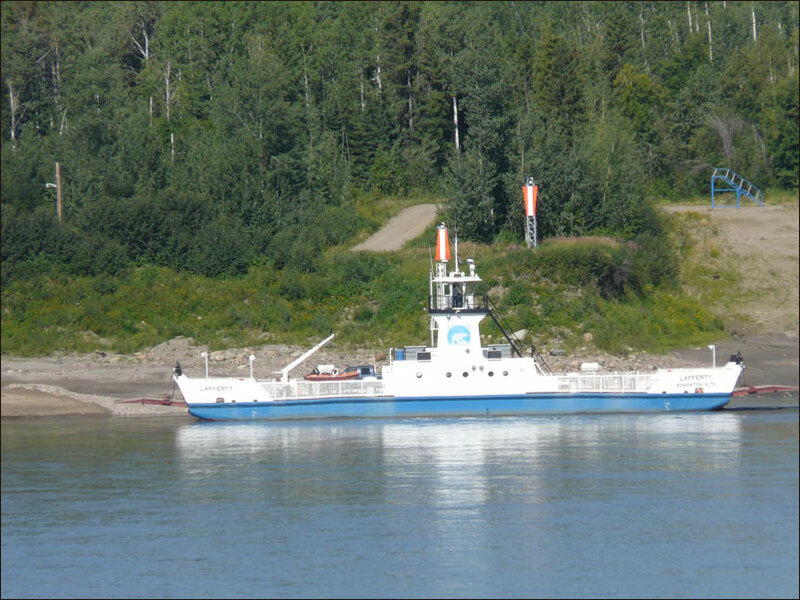 Our return to Fort Simpson included ferrying across the Liard River. A SUMMARY: The Trip of a lifetime! It is difficult to put into words my thoughts about the trip. The problem is that there are not enough superlatives to use in describing the experience. 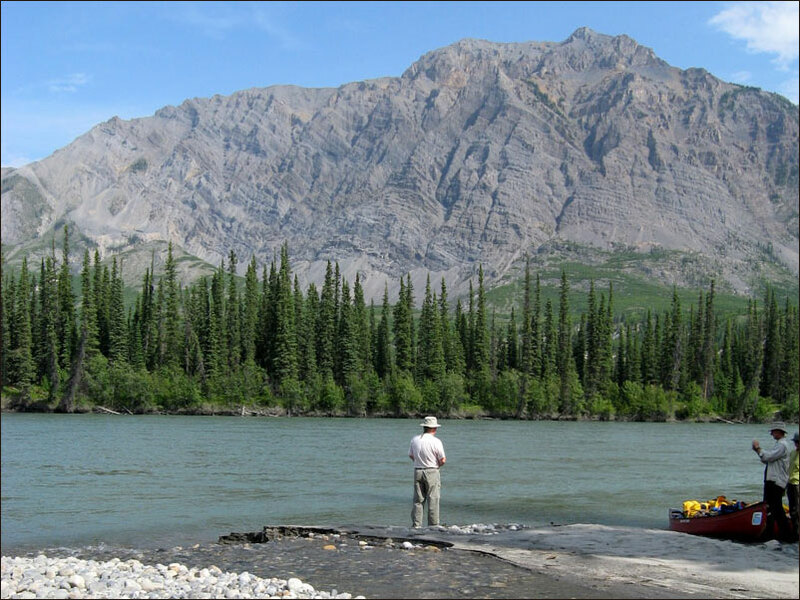 My focus is on the necessities: The personnel, the food, and the scenery. Our Guides (Liz, Maya and Jamie) were amazing! They were incredibly competent on the water and onshore. There was never a moment when the group could not rely on their advice or instruction. 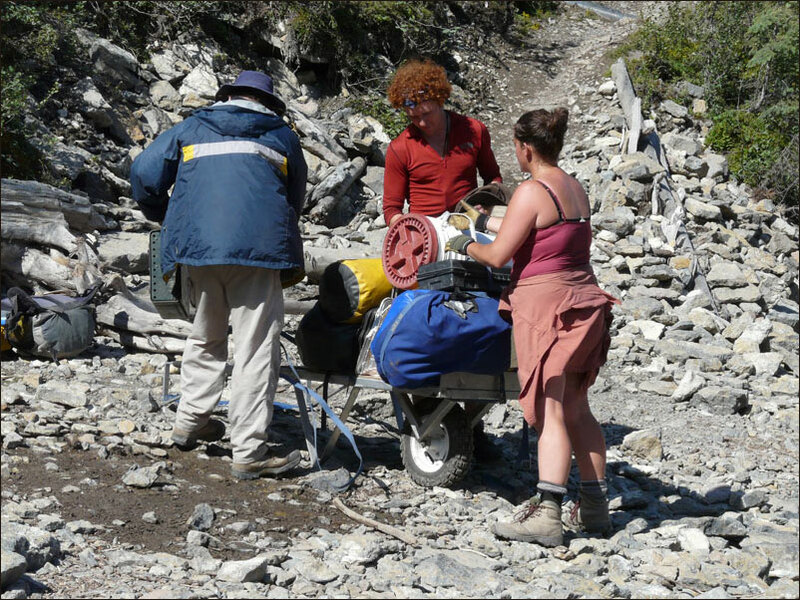 For their age (mid to late twenties), they had a wealth of experience to offer the group. 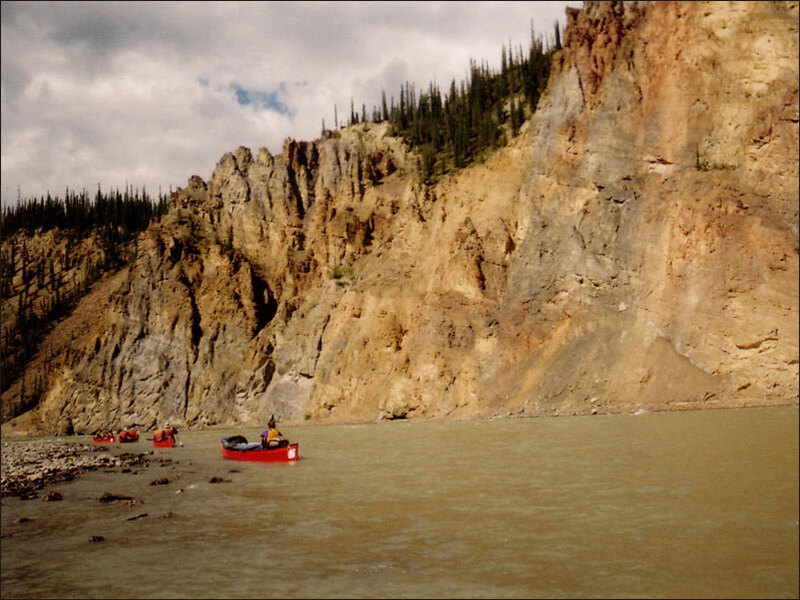 Their passion was not only for canoeing, but also for the Nahanni River itself. 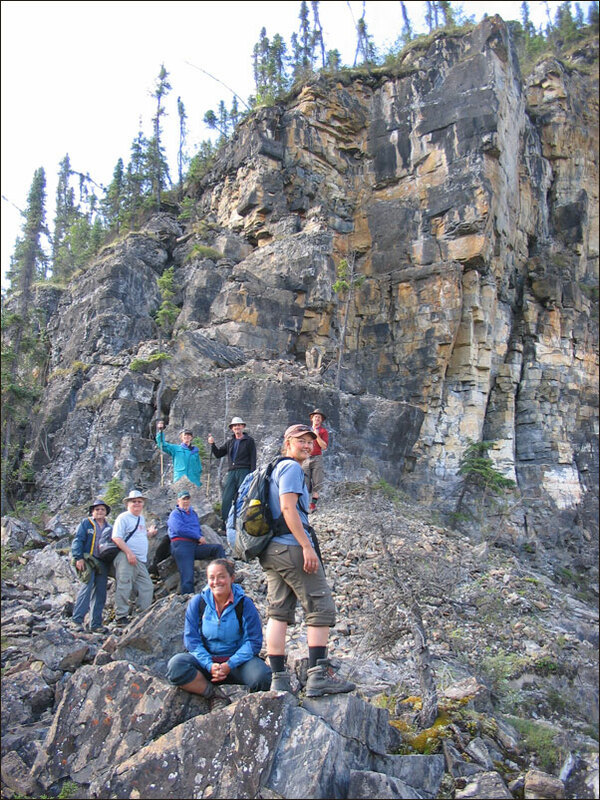 They were fully aware of the history and geology of the area and shared it with us. They successfully coached us past our pre trip limits for handling waves. ("a bit splashy", as Liz said several times). They were constantly energetic and enthusiastic about anything and everything. Until this experience, we were used to a freeze/dried type of menu. The food was great. The logistics of having fresh fruit and vegetables, and keeping meat frozen over two weeks is difficult, but in addition, to be able prepare meals that would pass muster in a lot of fine restaurants is incredible. 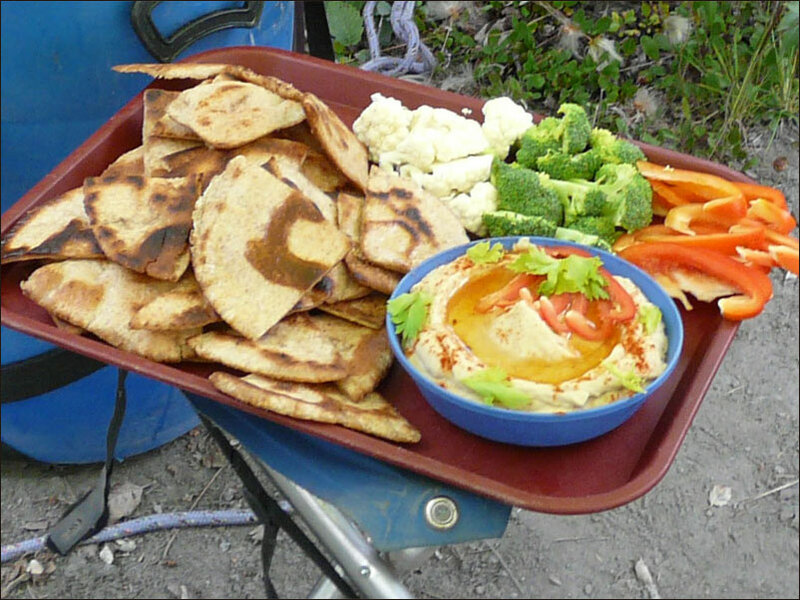 The variety and nutrition level of the meals was excellent and there were always ample quantities. The pace of travel suited our group very well. 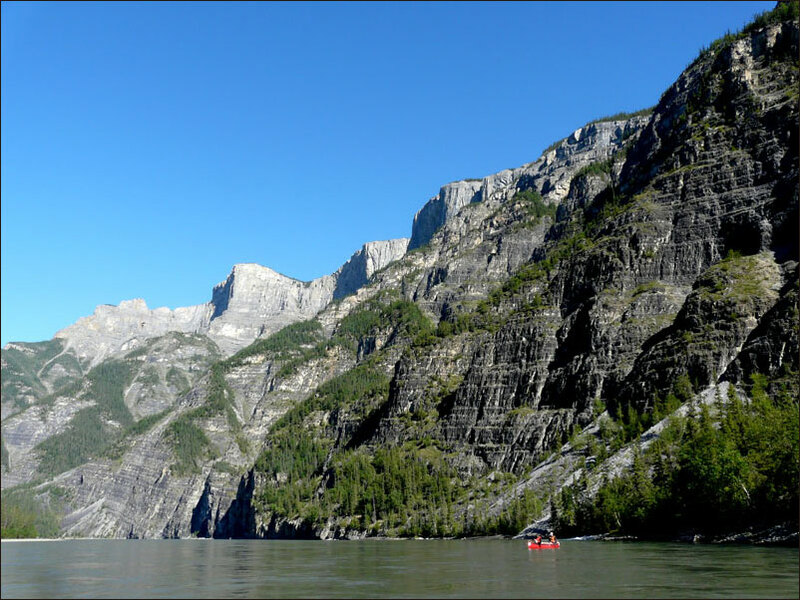 It is one thing to work out the distance on the water and figure out the number of days needed for the trip, but it is another when side trips like the Pulpit hike, Chasm of Chills, Kraus Hotsprings, and, of course, the weather and potential canoe dumps are factored in. 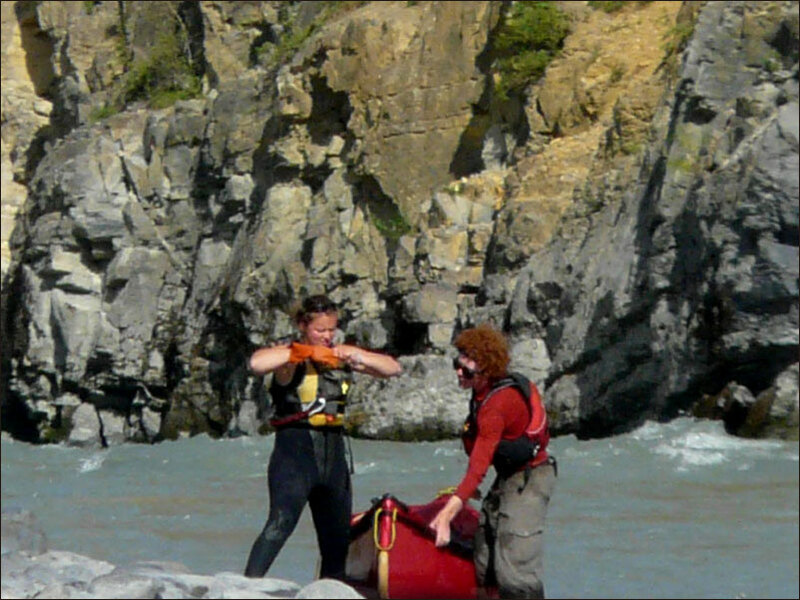 There was never a time when the group felt pressured to go farther and there was always time to analyze an upcoming bit of rough water so that we felt comfortable trying it. 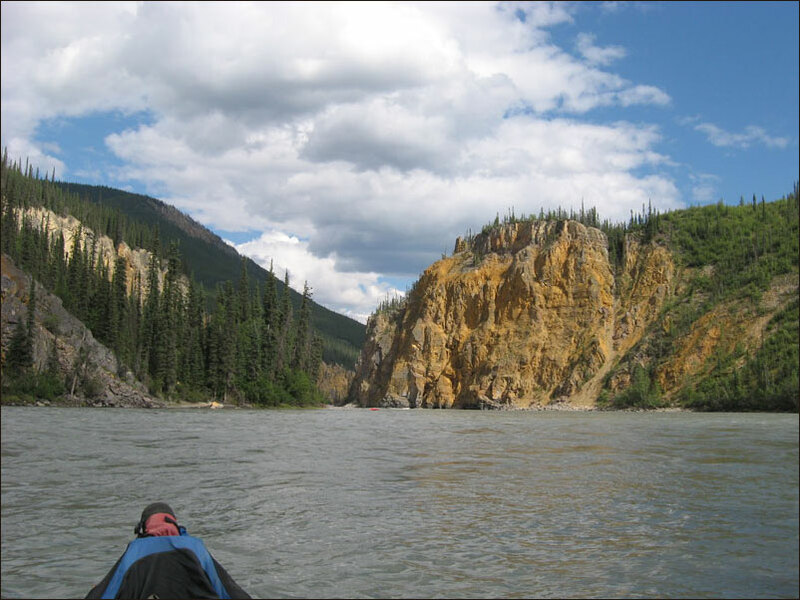 The Nahanni is truly a "jewel among rivers"! At times, it was almost too much visual stimulation to handle. 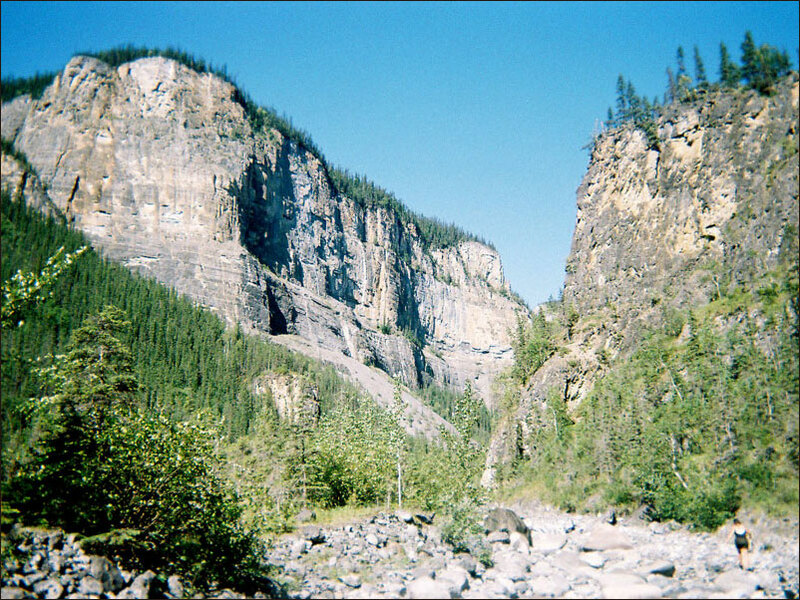 The canyons were overpowering in height and in colour. Around every corner there was something new and different to look at. 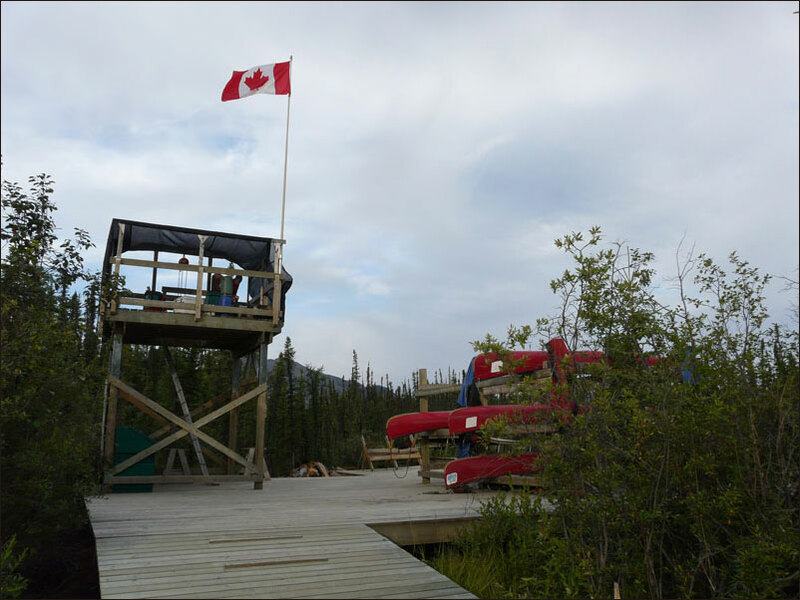 The Parks Canada staff were a fountain of information about the environment and the culture of aboriginal peoples. The guides celebrated the more recent history as written by Patterson, the McLeods, and others. The river itself was a wonder with the current, the hissing of the silt on the canoe hull, and the waves. 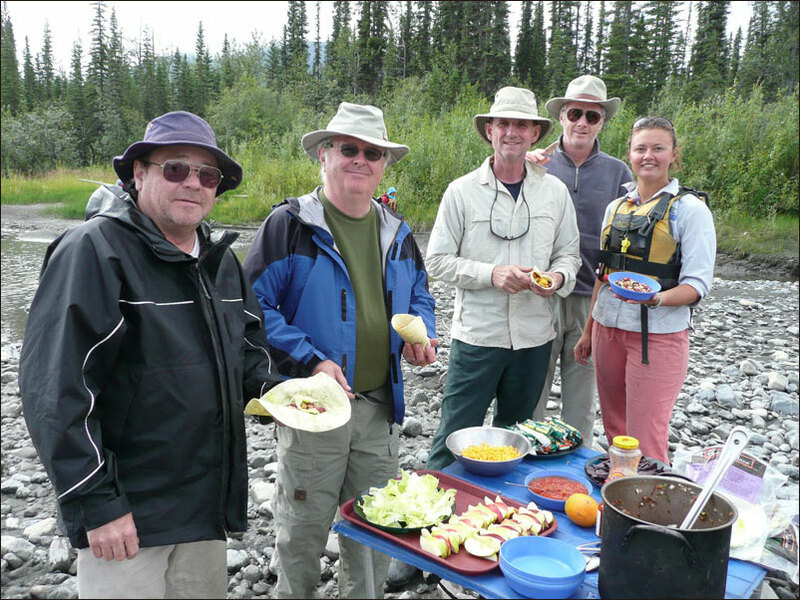 Our group consisted of six clients and three guides, the clients loosely divided into 3 sets of partners. Prior to the trip, no partner set had met anyone else. Within a day, we all became very comfortable with each other and a high level of trust was established within the group. 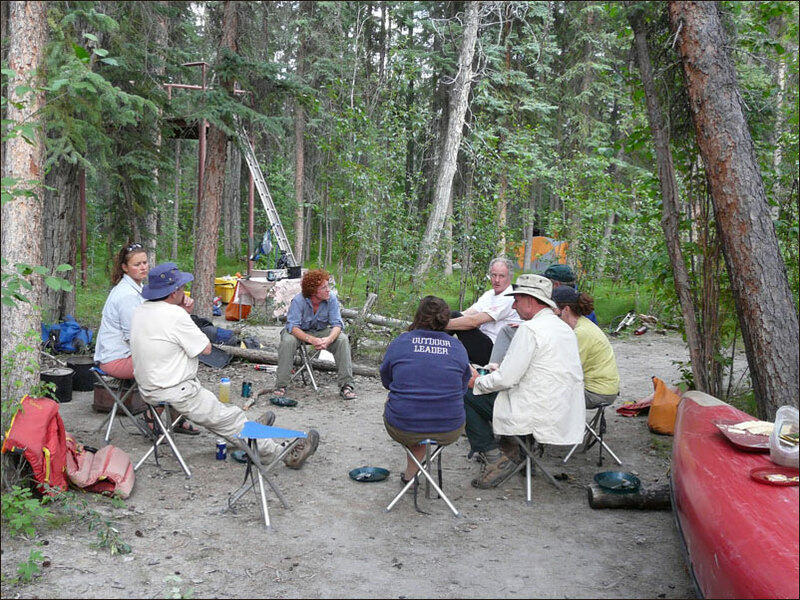 This resulted in a relaxed atmosphere, which is critical to a great trip. 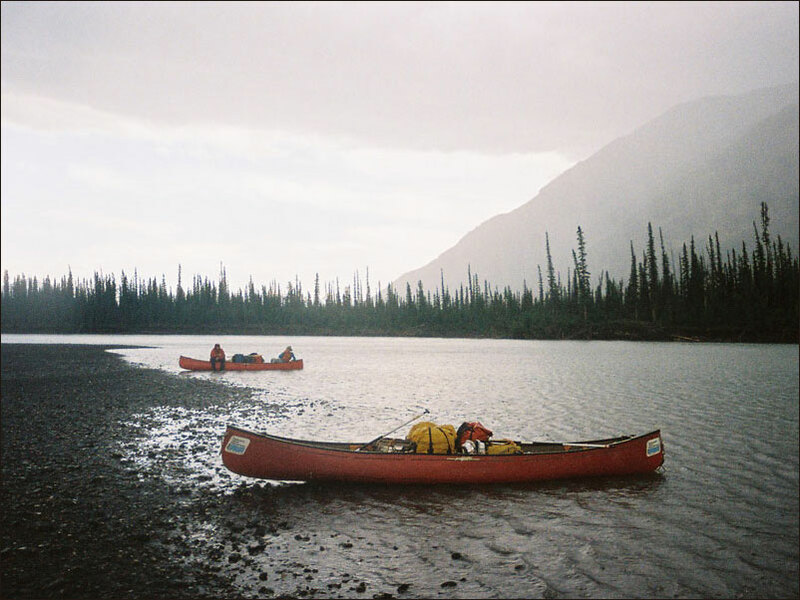 Over the past 20 years, I have canoed in quite a number of northern environments. As well, I have 'Rockhounded' all over Ontario and in the United States. 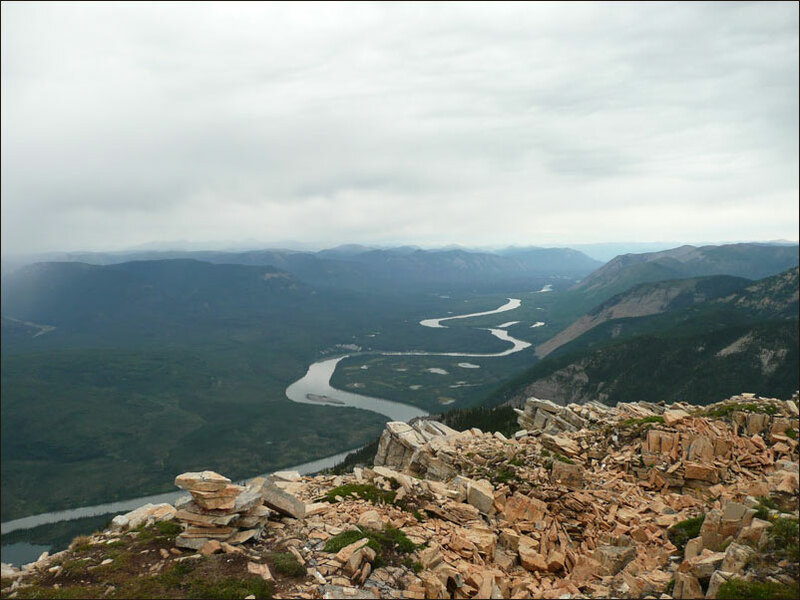 What I have seen in terms of natural resource extraction has varied with the location. 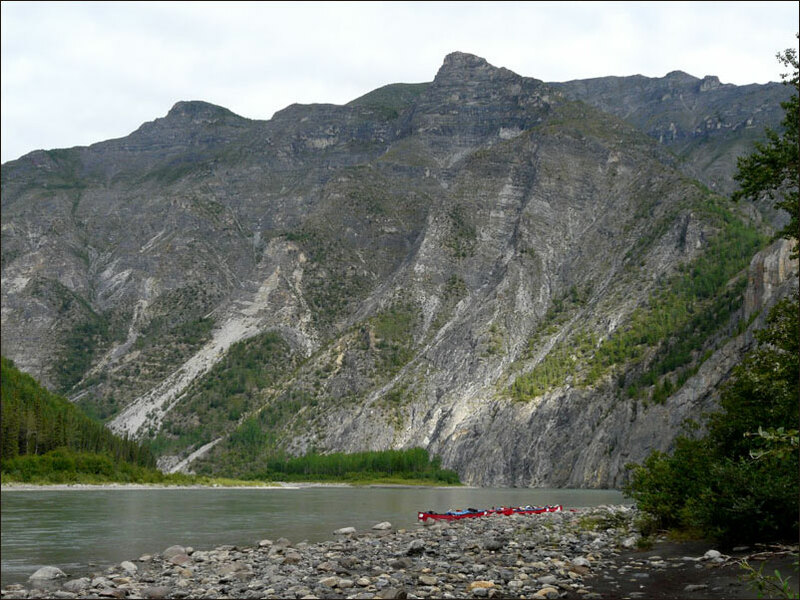 This Nahanni River trip brought a lot of my impressions into focus. The resource extraction industries may be large in terms of dollar value and employment, but tend to be short term enterprises. 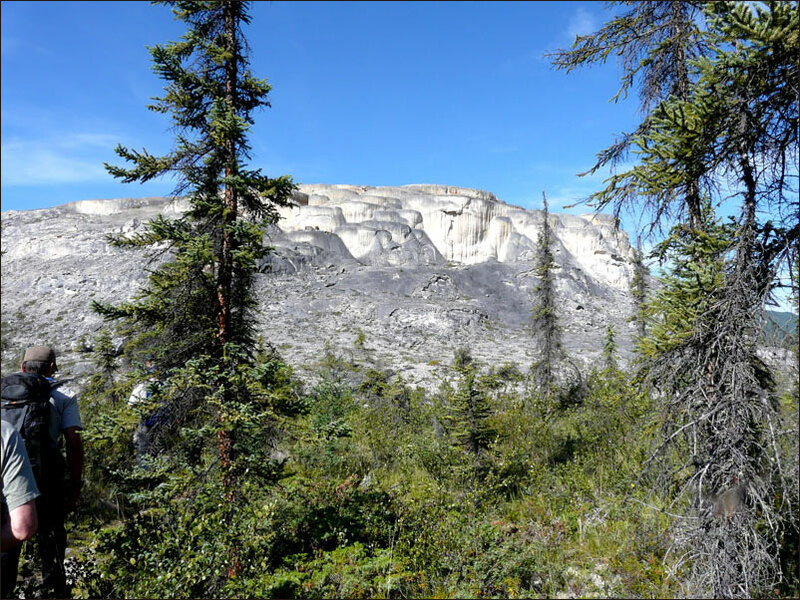 Most mines and logging operations have a limited local effect while they are working, and when they leave, they leave behind damaged ecosystems which take decades, if not centuries, or more to rejuvinate. 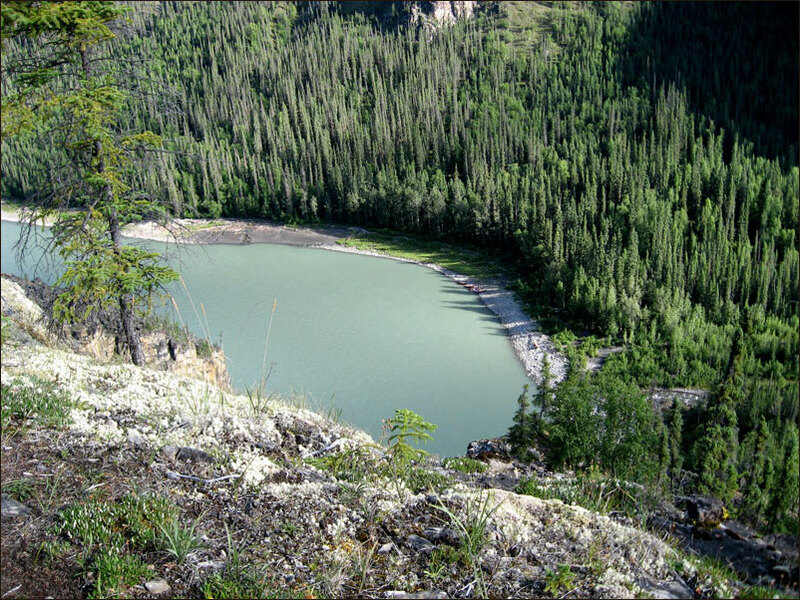 In many mining situations, the toxic tailing deposits are left on the land to leach into the watershed over a timeline which approaches forever. 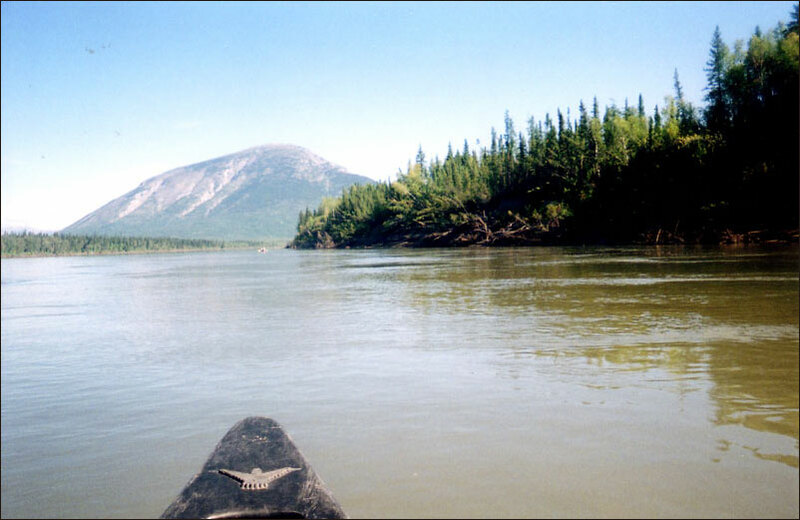 In many areas, the damage is masked by a berm or, in the case of 'forested' rivers, by a strip of trees along the waterway wide enough that a canoe tripper cannot easily see the clear cut a short distance from the water's edge. When we don't see obvious damage to an ecosystem, we tend to assume all is well. The problem with that attitude is that we miss the hidden damage. We miss the effect of mine waste leaching into the water and of the habitat destruction of the clear cut. The damage to the food chain only becomes obvious after a number of years. The disruption of historic migration routes for birds and mammals that is caused by access modes such as pipelines and roads associated with the resource industries also becomes an issue. A look at Google Earth with the patches of orange and light beige indicates the extent of the damage to the forests. I wish there was a way of showing the effects of mining other than that of open pit operations. 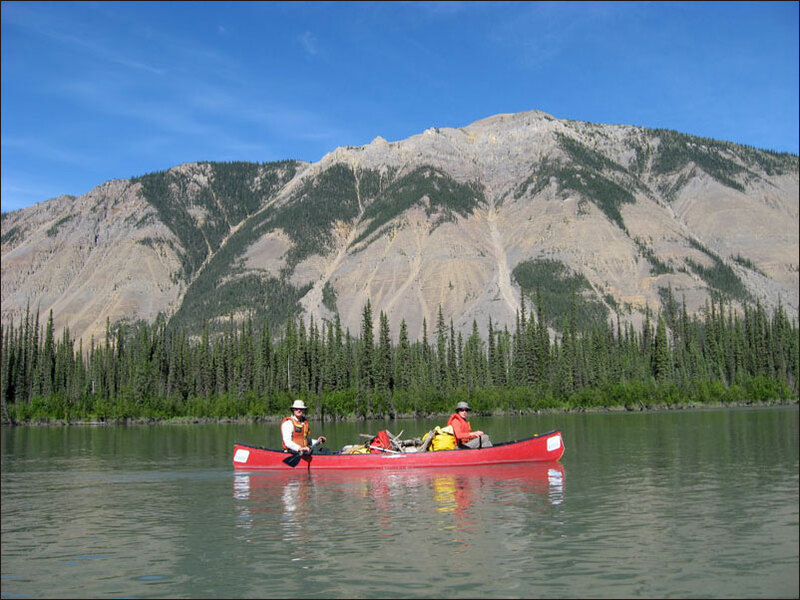 The experience of a low ecological impact canoe trip on the Nahanni underlines the importance of preserving areas such as this in as pristine a condition as possible. 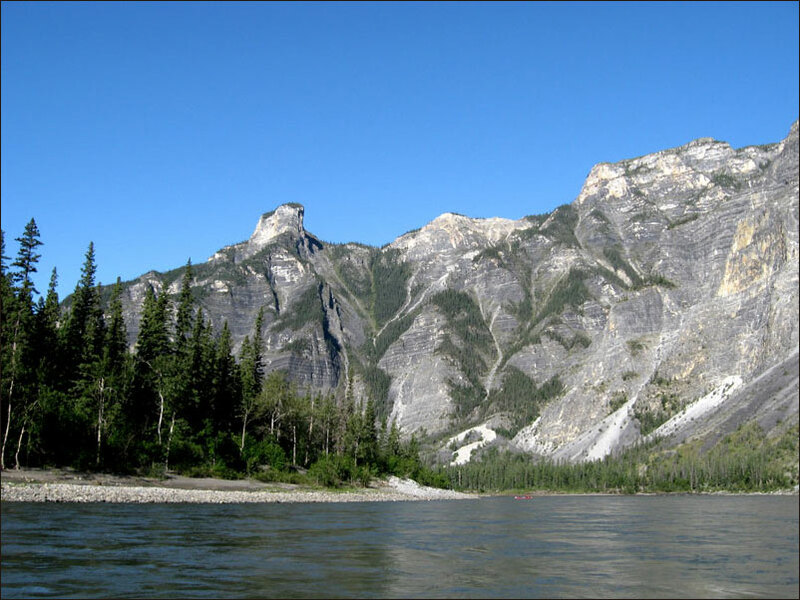 Hopefully, PARKS CANADA, and interest groups such as CPAWS will be successful in their influence over the development of the watershed into an area that is left 'as is', or better. 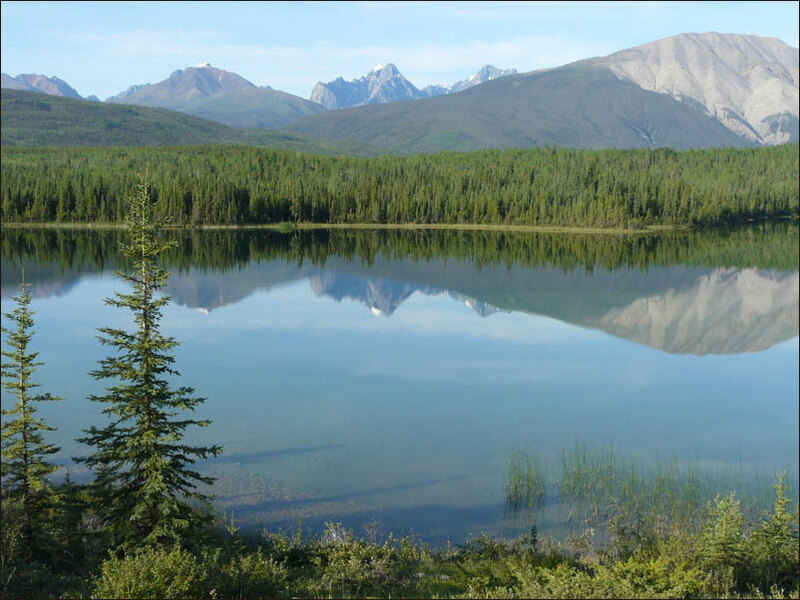 As much as we think that we might need to consume minerals and forests in order to make our short term lives better, we must recognize the need to maintain wilderness expanses for the long term. It is, therefore, incumbent upon us to support the efforts of groups such as the aforementioned in order to preserve what we have now and, if possible, improve on it for others to experience. Future generations will appreciate our efforts.